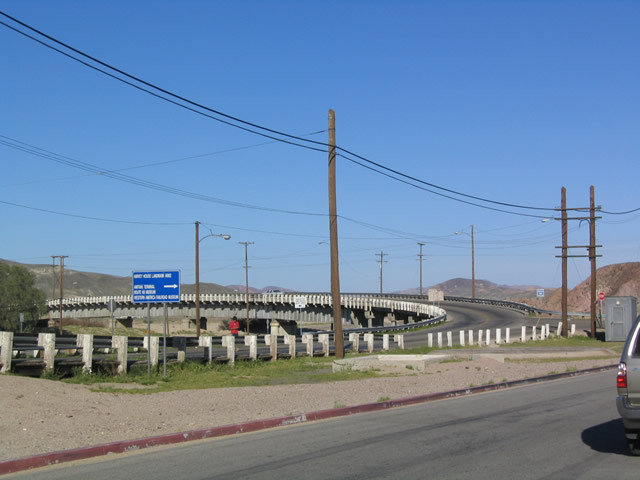 U.S. 91 is a former U.S. route that started at the intersection of the Pacific Coast Highway and Atlantic Avenue in Long Beach. 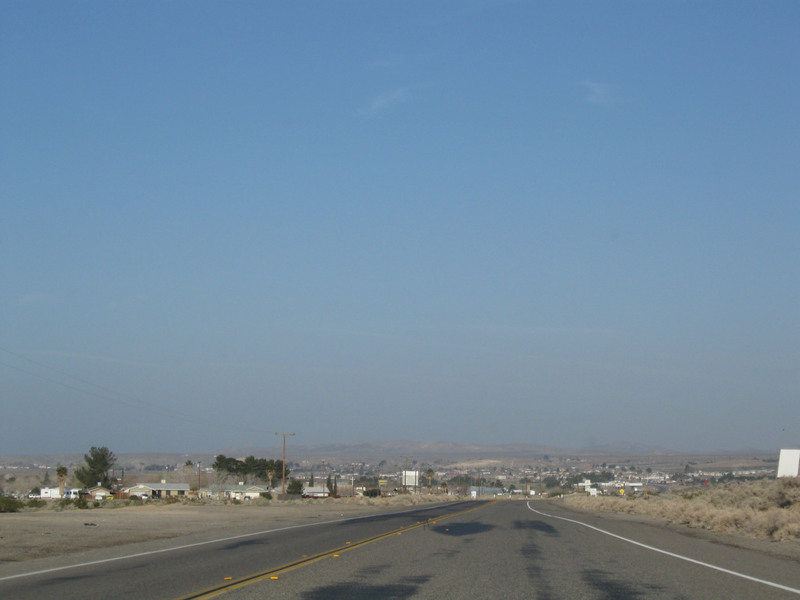 Heading due east along with Alternate U.S. 101 (now California 1) on the southbound Pacific Coast Highway, U.S. 91 turned north on current California 19 (Lakewood Boulevard). 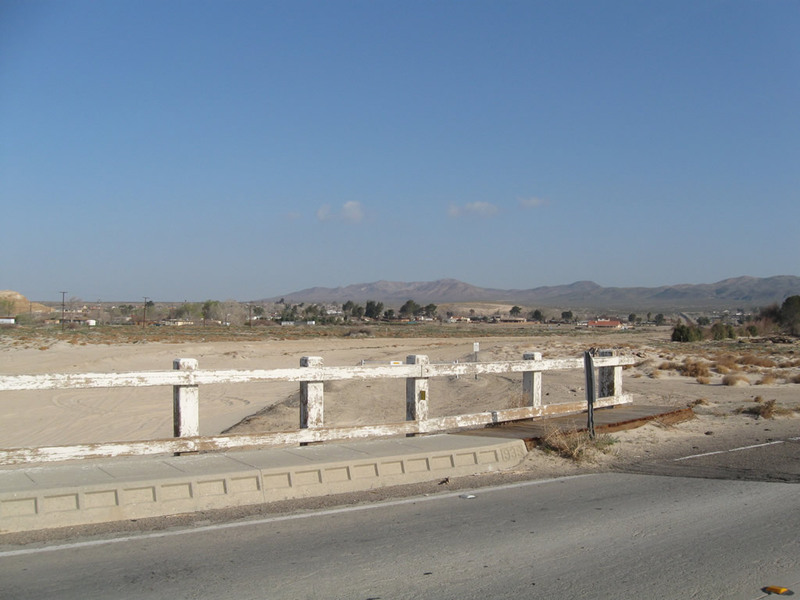 At Carson Street, U.S. 91 turned east, continuing along Lincoln Avenue until reaching the Santa Ana River Canyon (and the California 91 freeway) near the California 55 interchange. 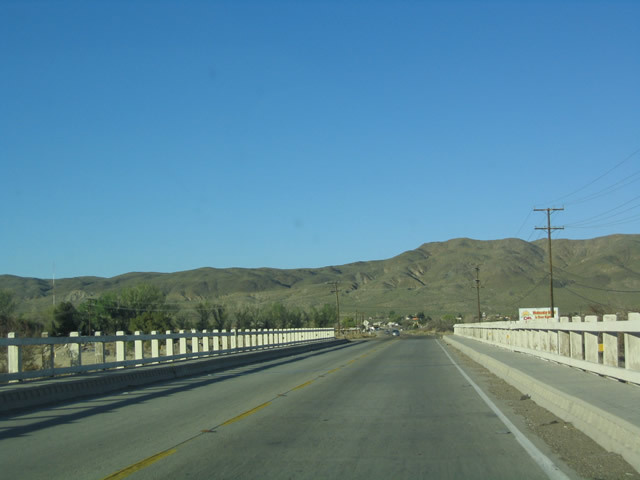 Paralleling today&apos;s California 91 (Riverside Freeway), U.S. 91 angled northeast through Corona and Riverside, and it merged onto northbound U.S. 395 en route to San Bernardino. 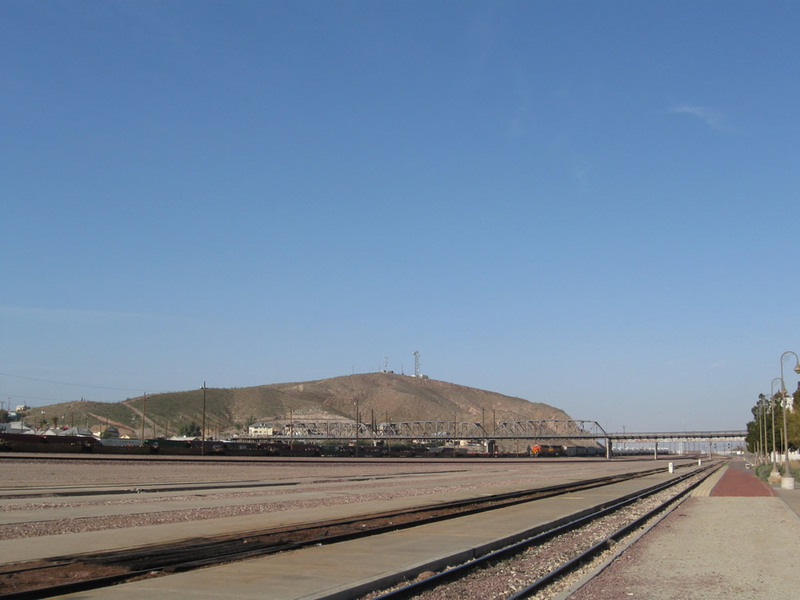 Picking up U.S. 66, U.S. 91-395 headed through the Cajon Pass, and U.S. 66-91 carried onward to Victorville and Barstow via Oro Grande and Helendale. 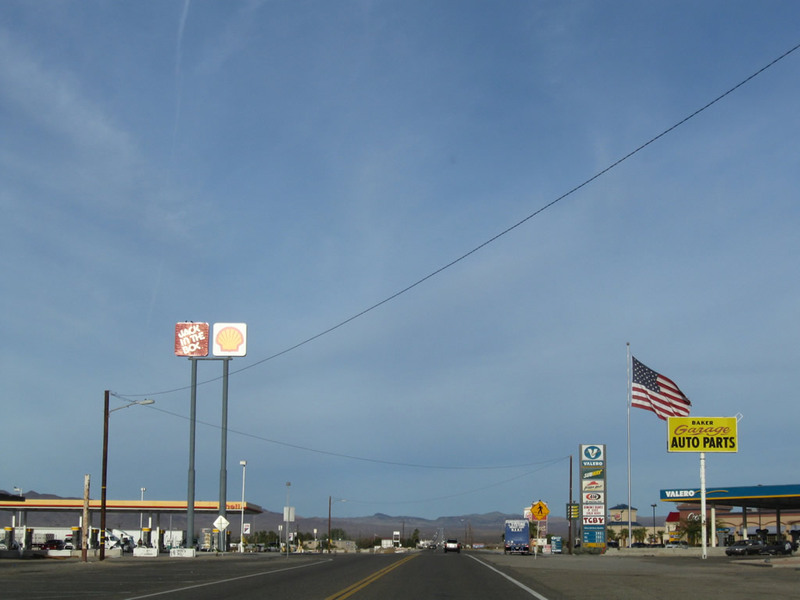 Northeast of Barstow, U.S. 91-466 angled toward Las Vegas; that route was supplanted by Interstate 15. 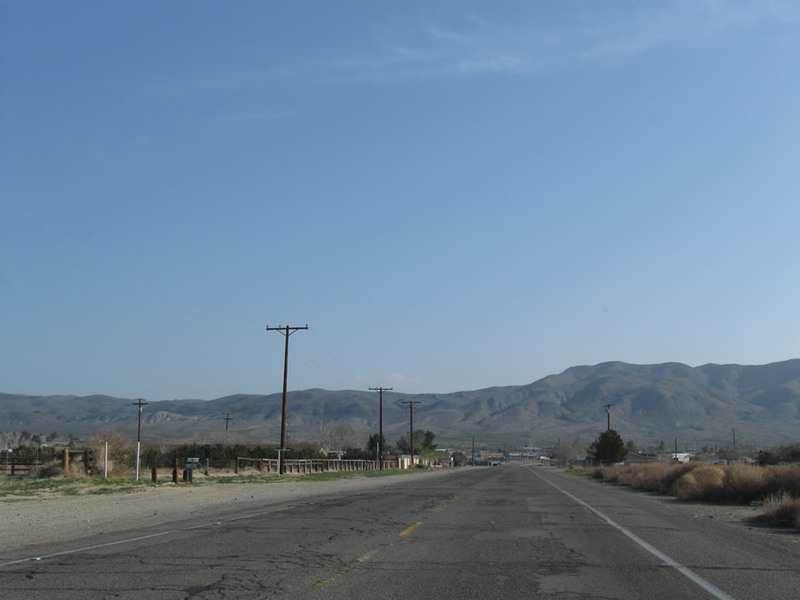 With the exception of some sections of U.S. 91 in the Los Angeles Basin and a two-mile segment in Barstow, the rest of U.S. 91 was duplicated by another U.S. route. 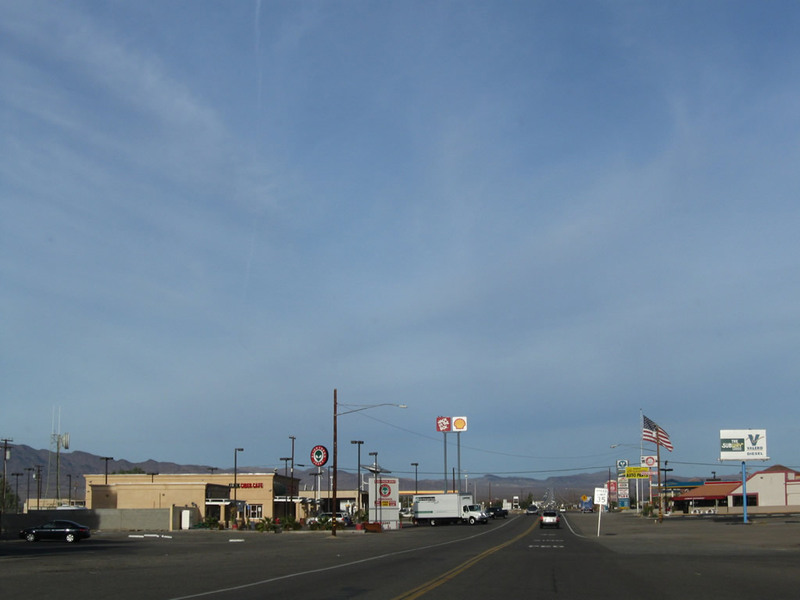 Historic U.S. 66 and U.S. 91 divide in downtown Barstow, at the intersection of Business Loop I-15 (Main Street) and First Avenue. 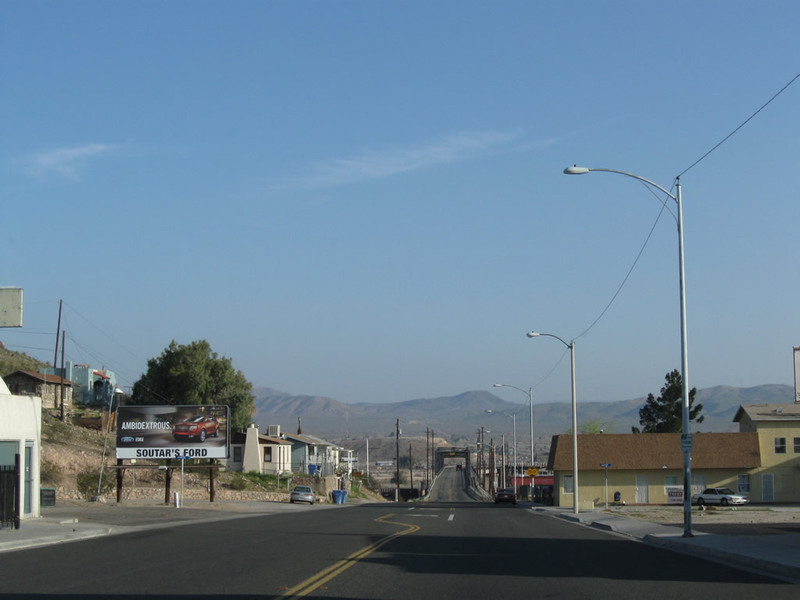 This view looks north on First Avenue after the Historic U.S. 66 (Main Street) intersection. Photo taken 03/15/09. 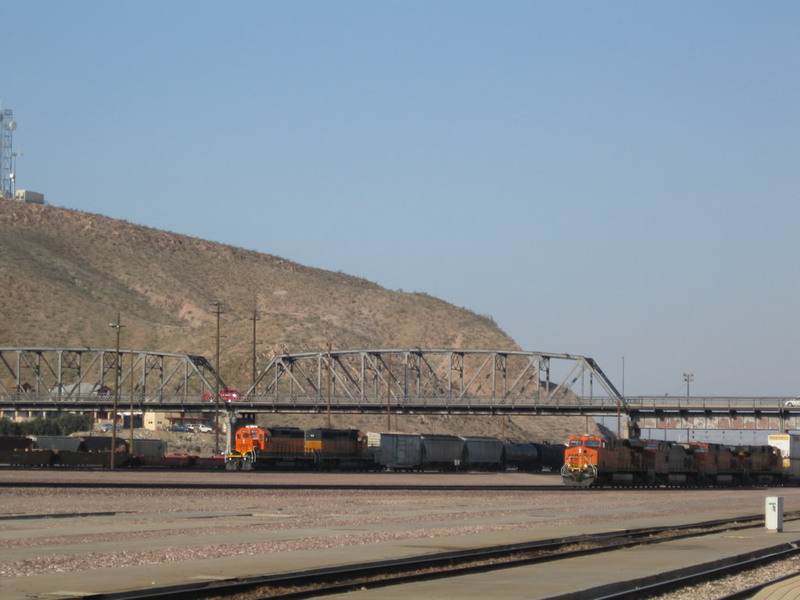 Heading north out of downtown Barstow, U.S. 91 immediately crosses the rail yard at Barstow via the Old Iron Bridge, which opened on April 26, 1930. 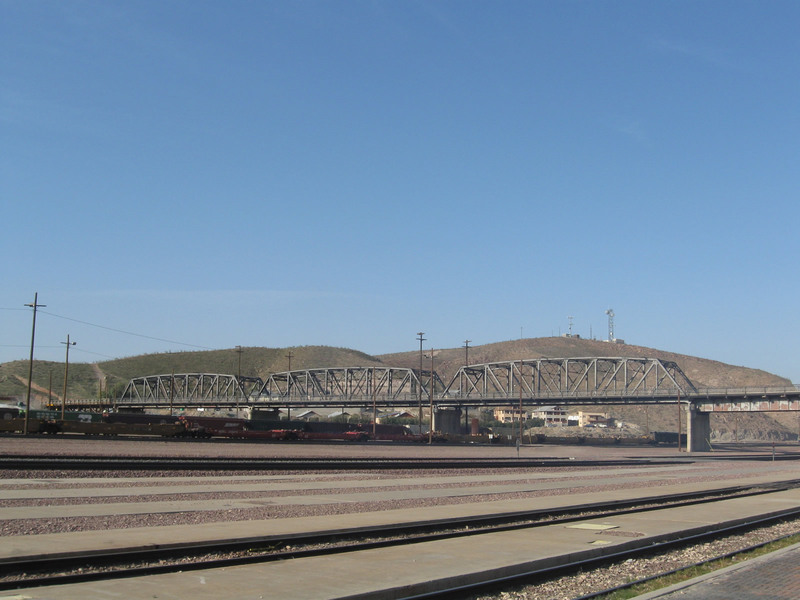 This bridge had to accommodate an ever-expanding rail yard as train operations continued to grow. 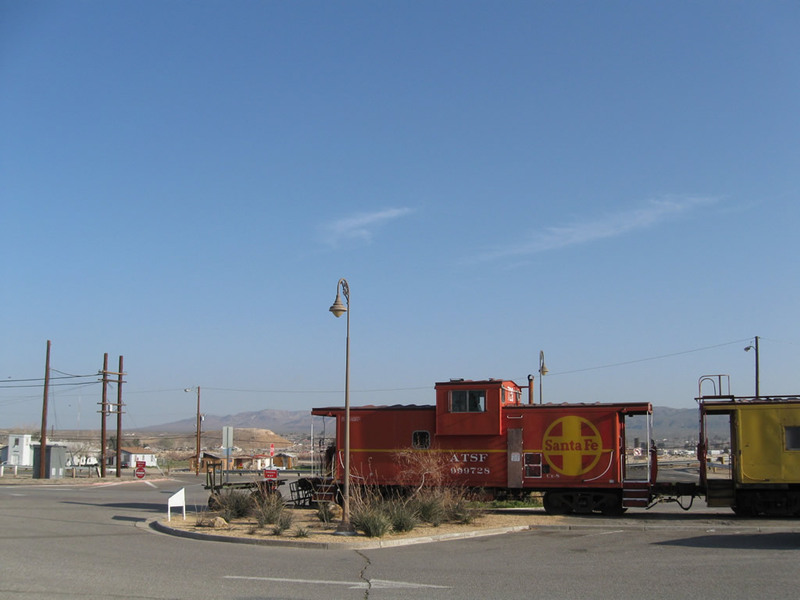 Today, trains constantly flow through town, making Barstow a hub of rail activity. Photos taken 03/15/09. 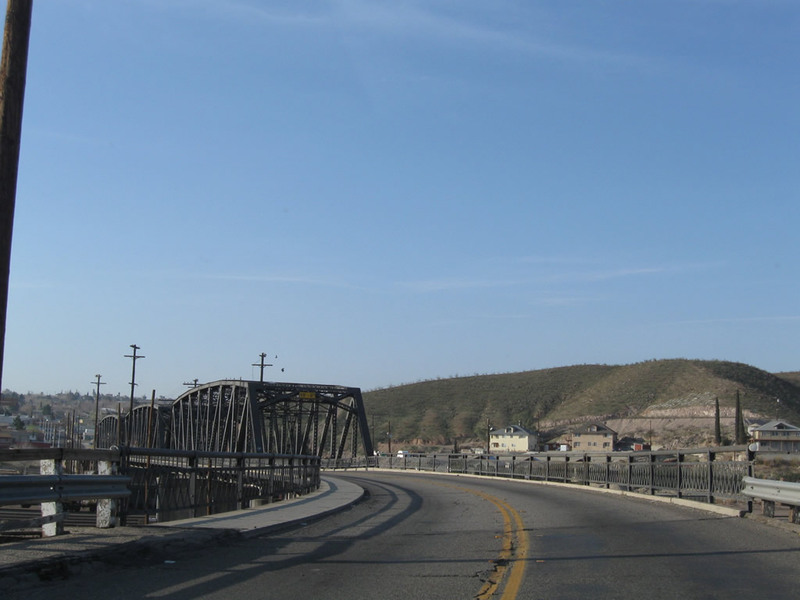 After leaving the truss section of the Old Iron Bridge, old U.S. 91 turns northeast toward the Harvey House and old railroad depot. 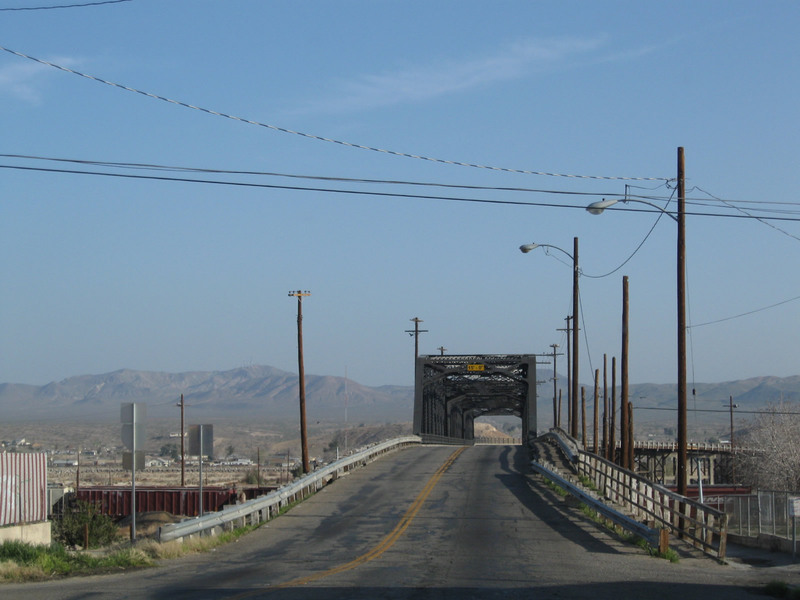 The Mojave River bridge comes into view in the distance. Photo taken 03/15/09. 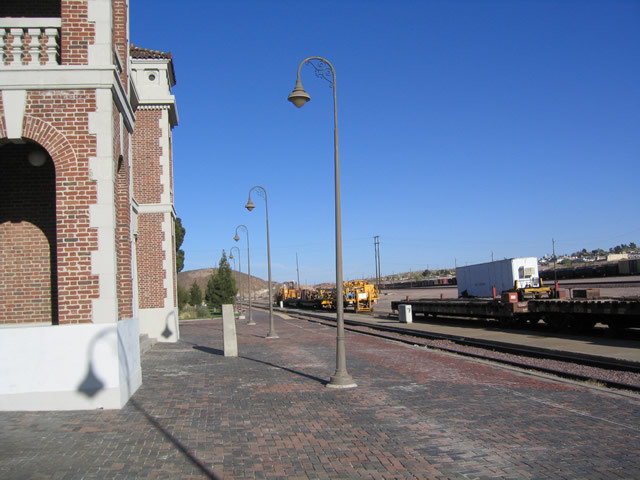 Northbound Historic U.S. 91 (First Avenue) reaches the turn off for the Harvey House, U.S. 66 Historic Museum, Western America Railroad Museum, and train depot. 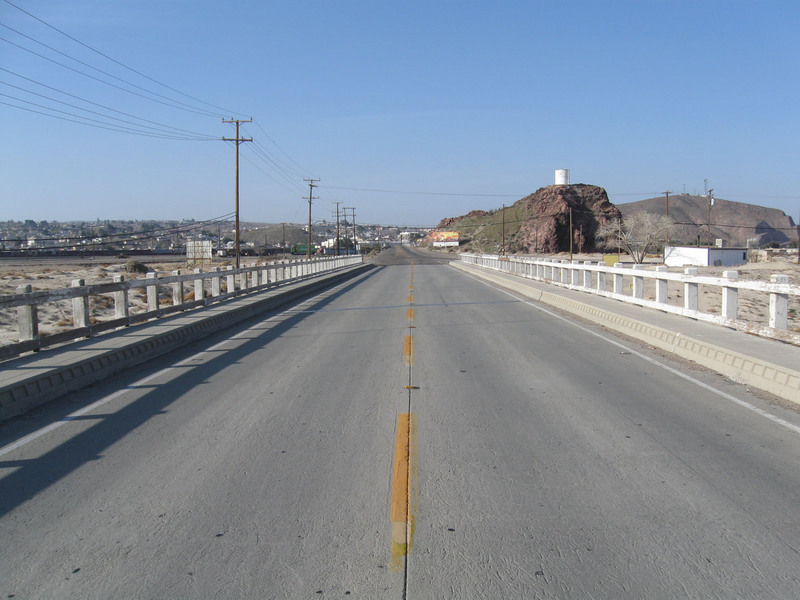 The highway only remains on the ground briefly, and U.S. 91 prepares to cross the Mojave River on a separate old bridge. Photo taken 03/20/04. 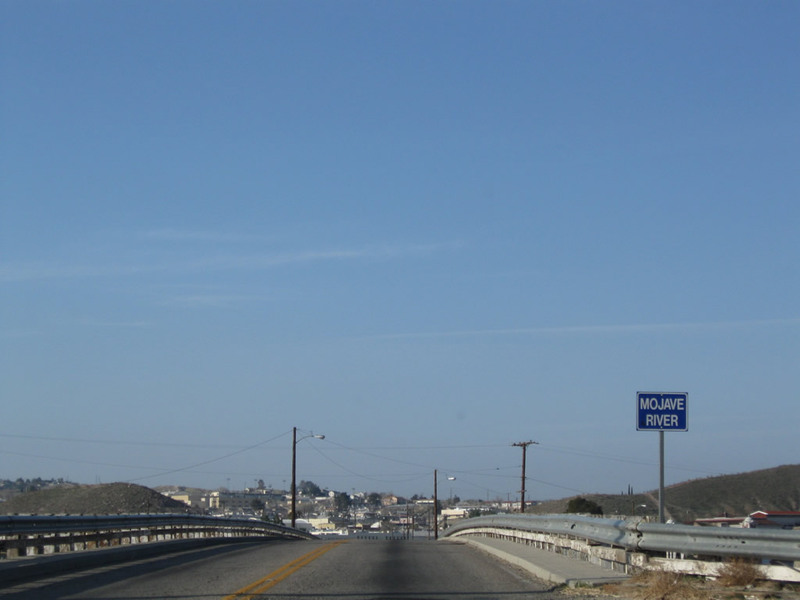 This suite of photos shows the Mojave River Bridge from the side of the bridge, including one shot from the sandy bottom of the Mojave River itself. Photos taken 03/20/04 and 03/15/09. 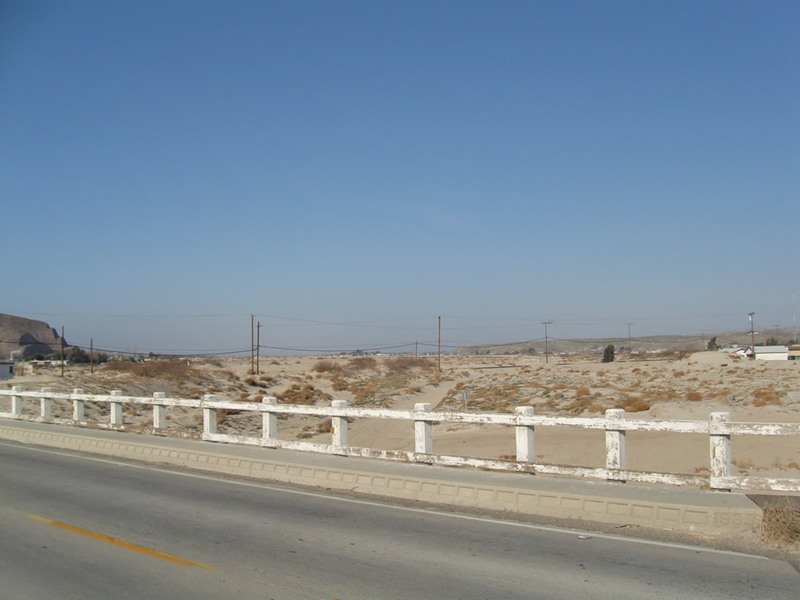 The white, wooden guardrail of the Mojave River bridge remains in place along U.S. 91. 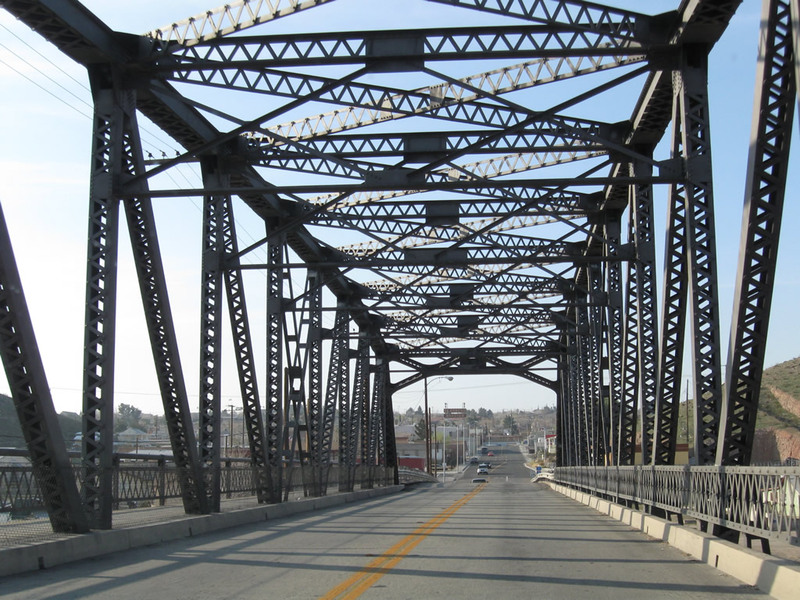 Also built in the early 1930s, this bridge remains largely unchanged since it was constructed. Photos taken 03/20/04 and 03/15/09. 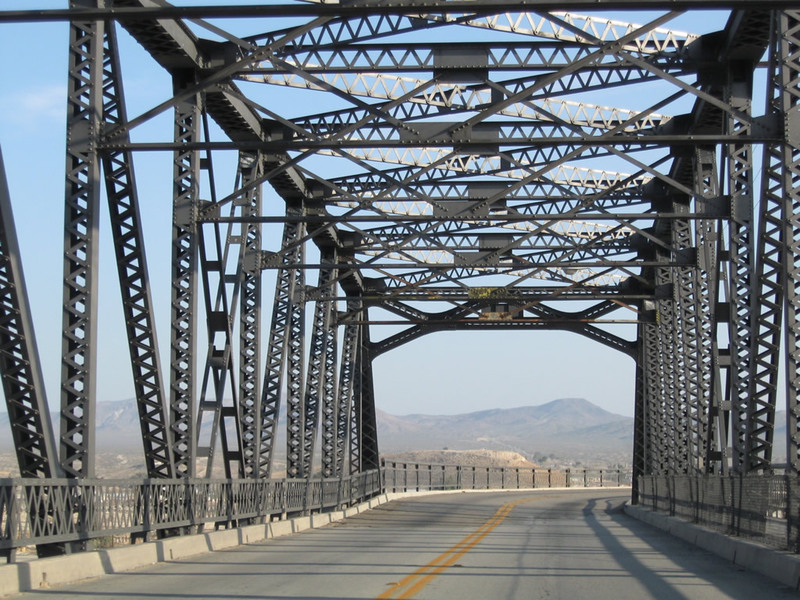 After meeting Irwin Road, northbound U.S. 91 crosses another historic bridge over a tributary to the Mojave River. 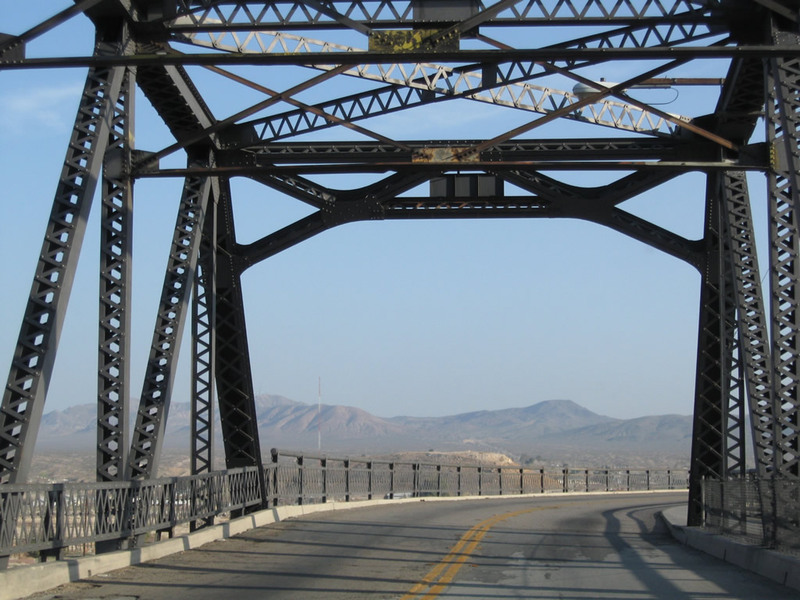 Like the main Mojave River bridge to the south, this bridge also features white wooden railing and also has concrete divoted curbing. Photos taken 03/15/09. 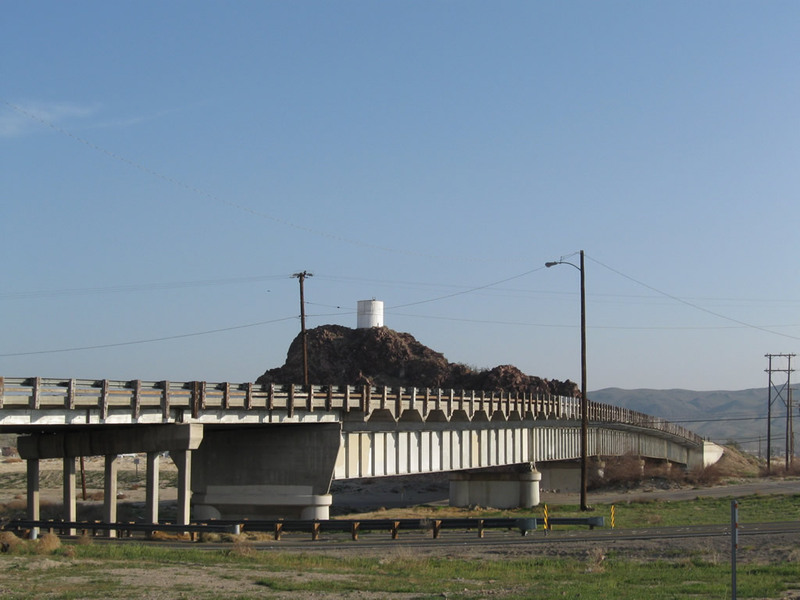 This series of photos shows the area around the second Mojave River bridge north of Irwin Road. 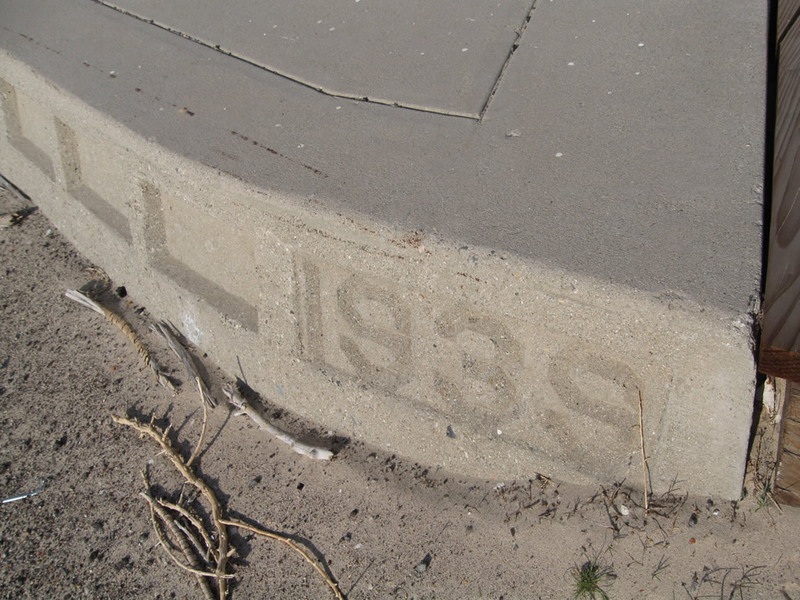 The date stamp identifies the year of construction as 1939. Photos taken 03/15/09. 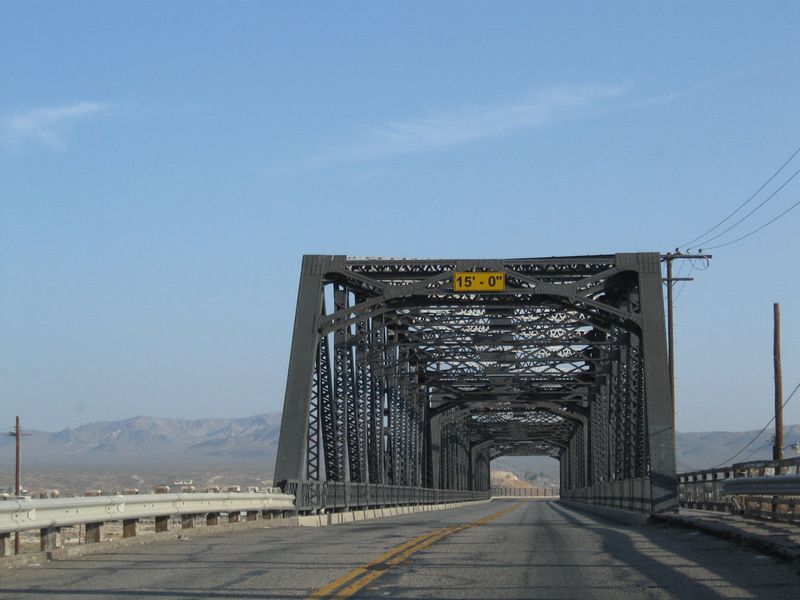 The road is a bit rough as it continues north past the second Mojave River bridge toward the junction with old U.S. 466. Photo taken 03/15/09. 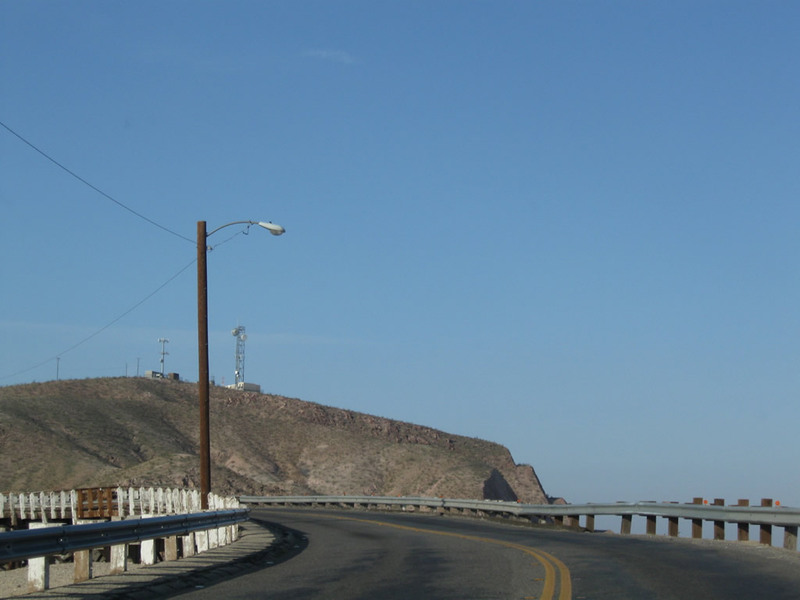 The road improves as we approach the intersection with Old Highway 58. Photo taken 03/15/09. 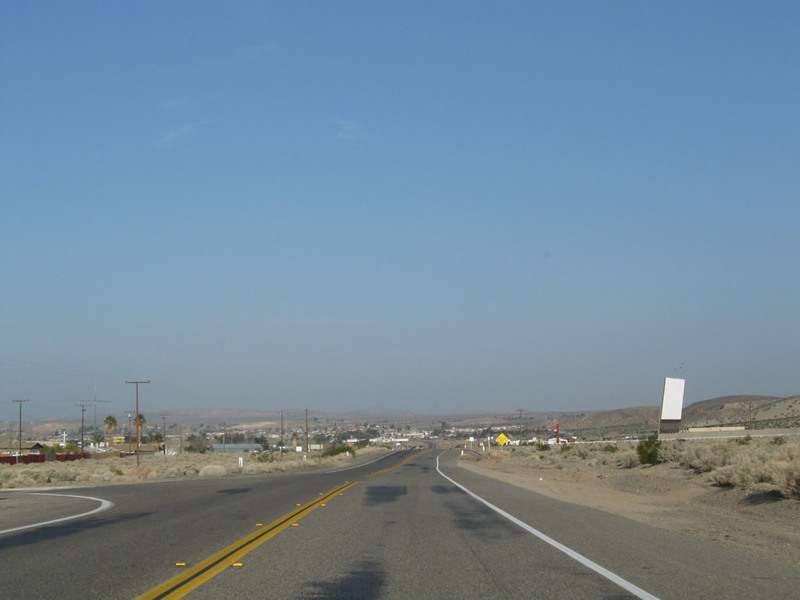 Northbound Old U.S. 91 meets Old California 58 (U.S. 466) northwest of Barstow. 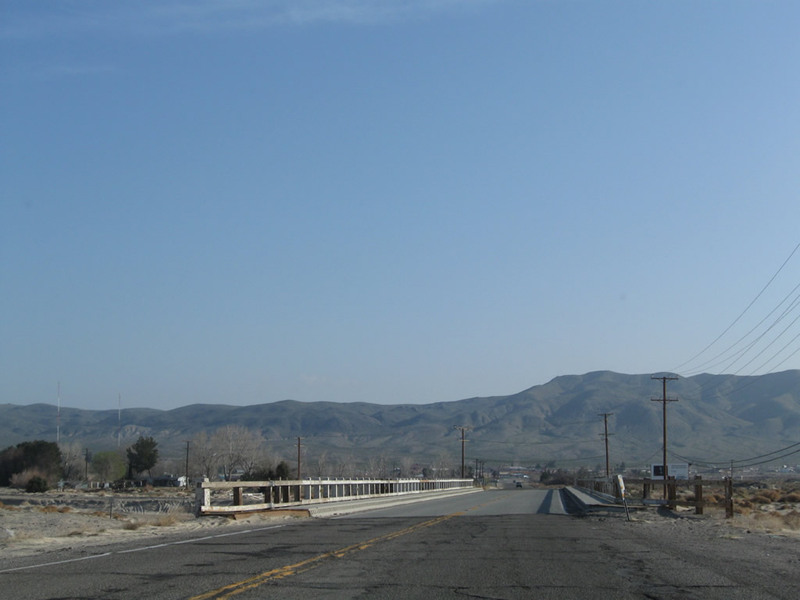 Old California 58, which was previously U.S. 466, heads west to Bakersfield and the Central Valley. 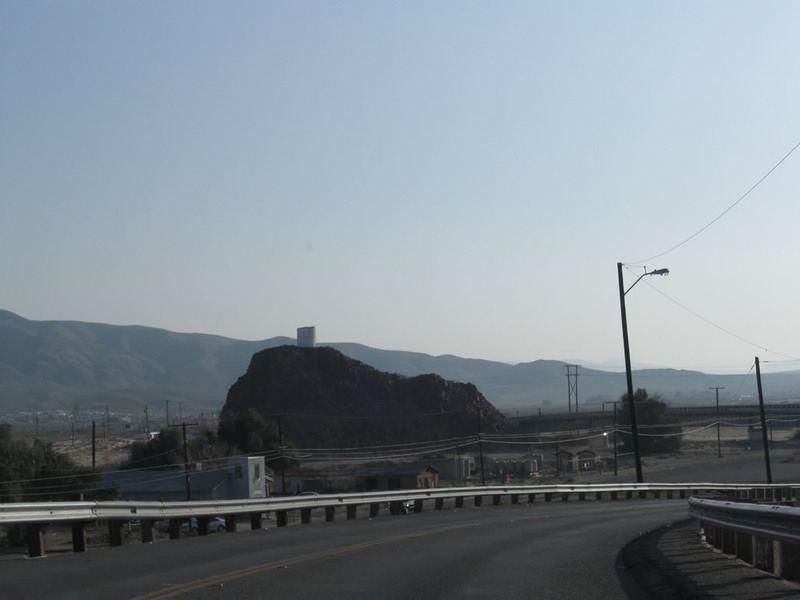 U.S. 91-466 and California 58 head northeast toward a junction with Interstate 15. Photo taken 03/20/04. 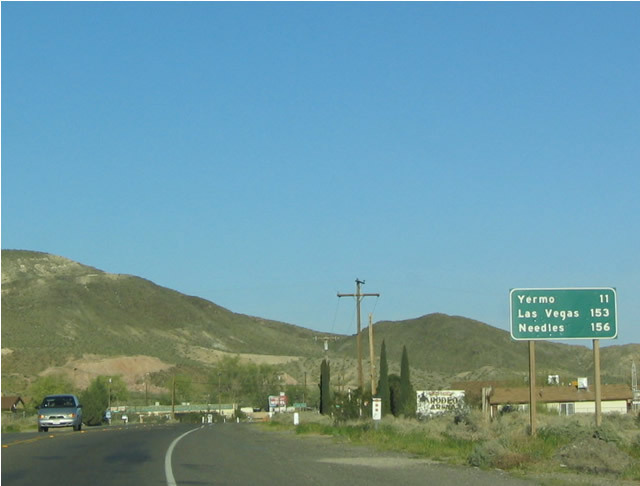 After passing by the Historic U.S. 91-466 intersection, the distances are to Yermo and Las Vegas, both of which are old U.S. 91 destinations. 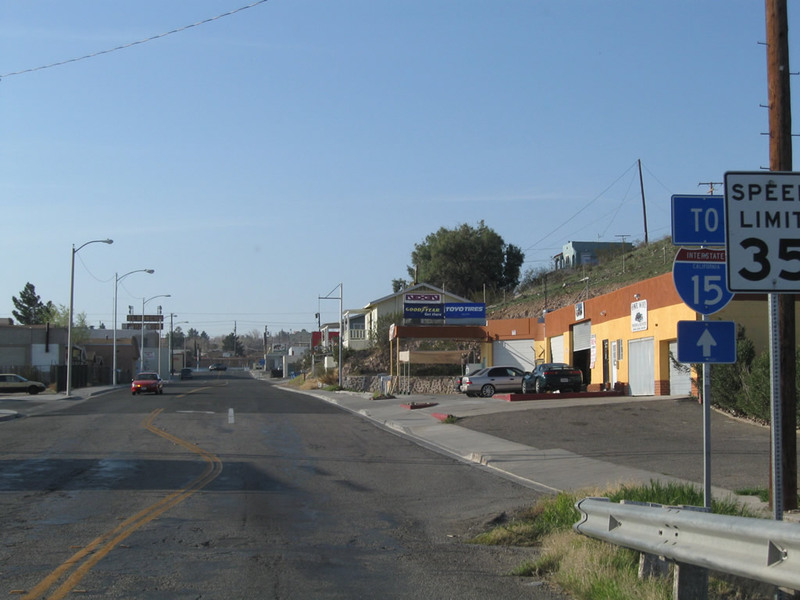 But the last city listed, Needles, is the control city for eastbound Interstate 40. 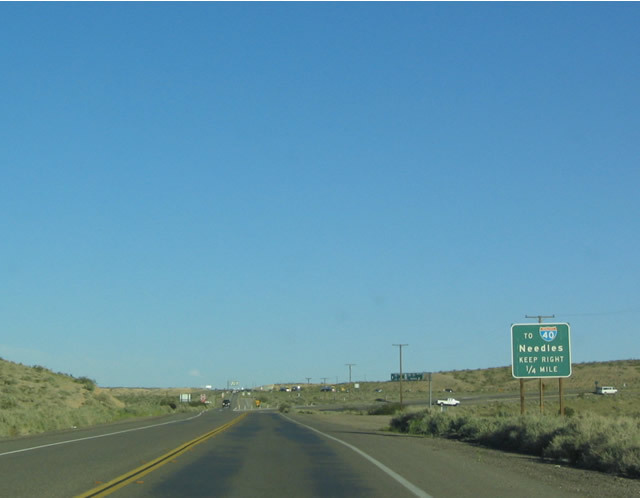 This was because many travelers from the Central Valley were continuing east on Interstate 40 after leaving behind California 58. Photo taken 03/20/04. 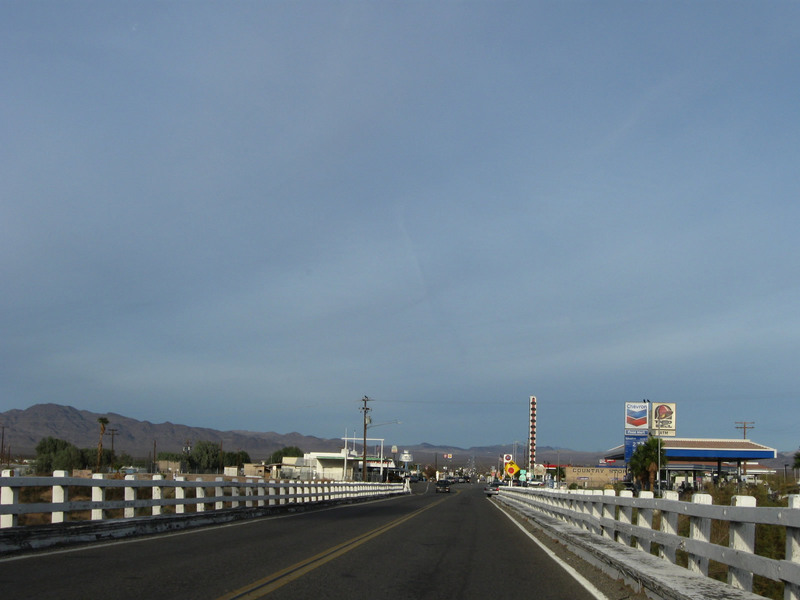 Since California 58 is more or less an extension of Interstate 40 along a freeway, for a time travelers had to use this two-lane road to make the connection to Interstate 40 via southbound Interstate 15. 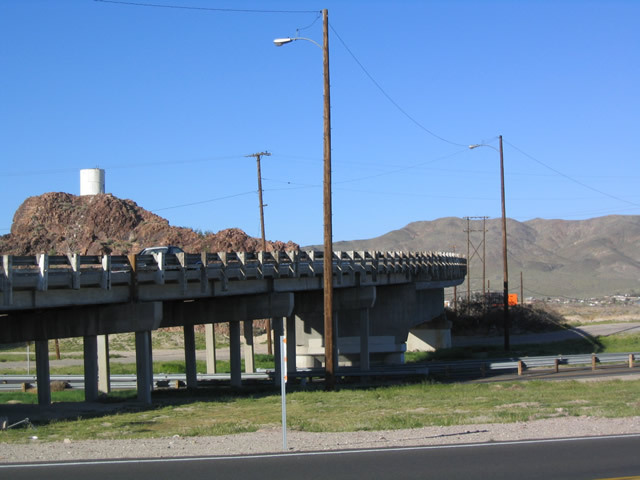 Now that the California 58 freeway connection has been completed south of Barstow, traffic from California 58 to Interstate 40 does not have to use this interchange. 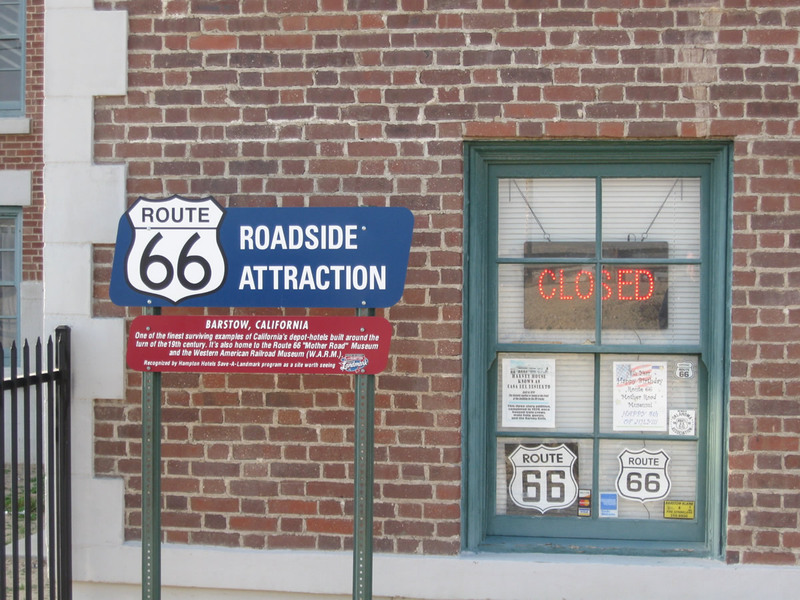 However, signs from that era remain. Photo taken 03/20/04. 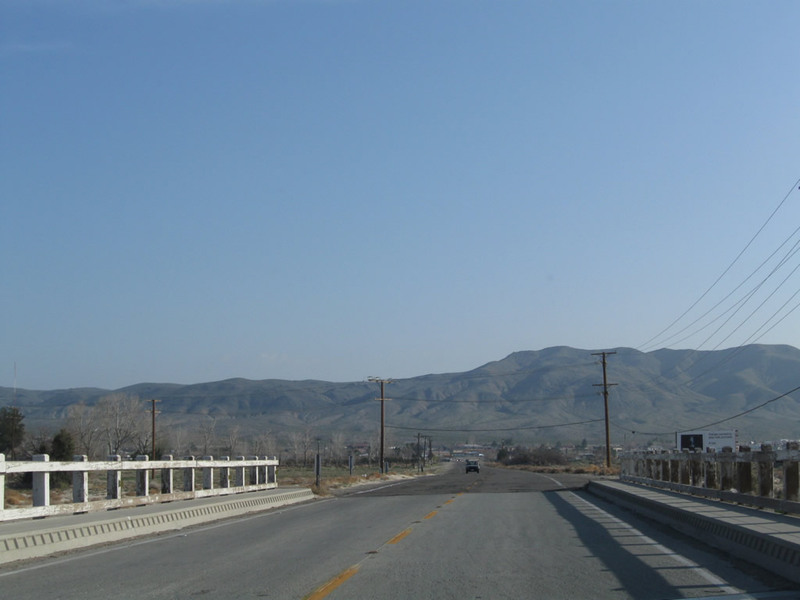 The old alignment of the highway would have taken U.S. 91-466 directly northeast from this point, but it was realigned to accommodate an interchange with Interstate 15. Photo taken 03/20/04. 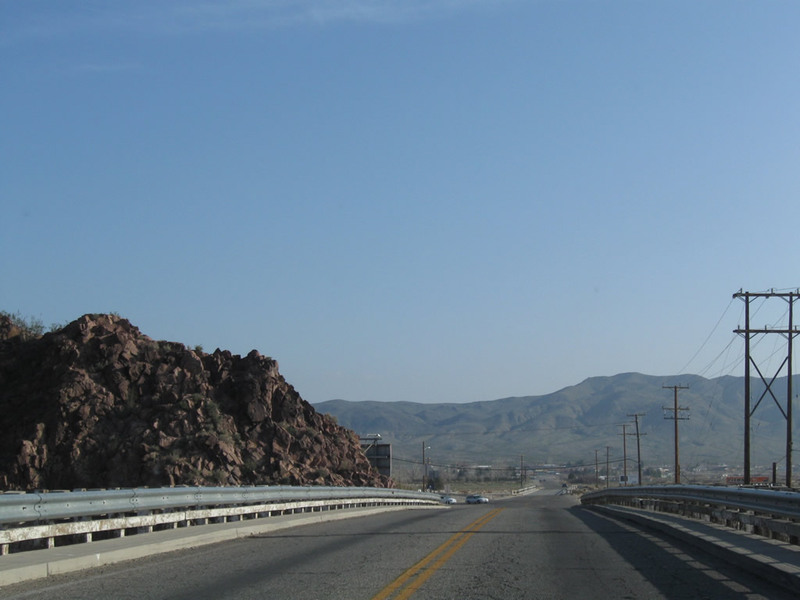 Now reaching Interstate 15, U.S. 91-466 historically followed Interstate 15 north toward Baker and Las Vegas. 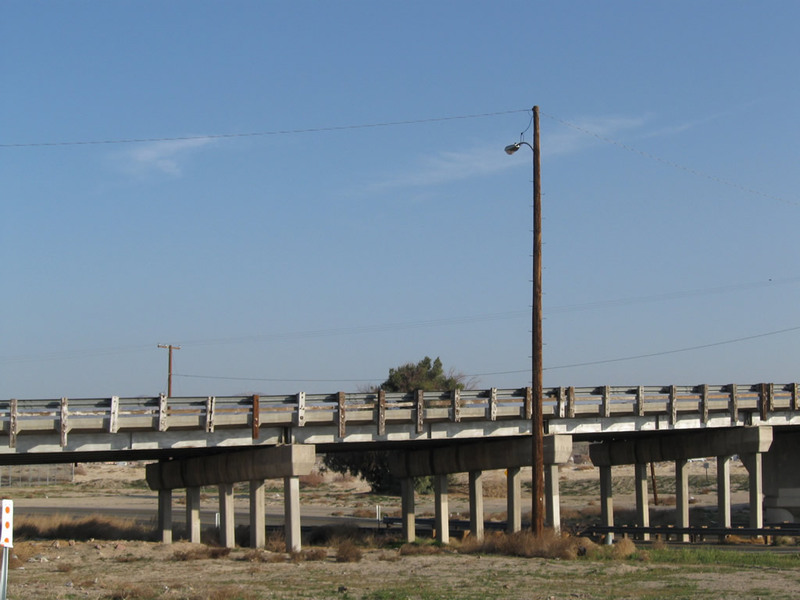 The section of Interstate 15 freeway between U.S. 91-466 and Interstate 40 did not exist, and all through traffic had to take U.S. 91 over two bridges to reach this point. Photo taken 03/20/04. 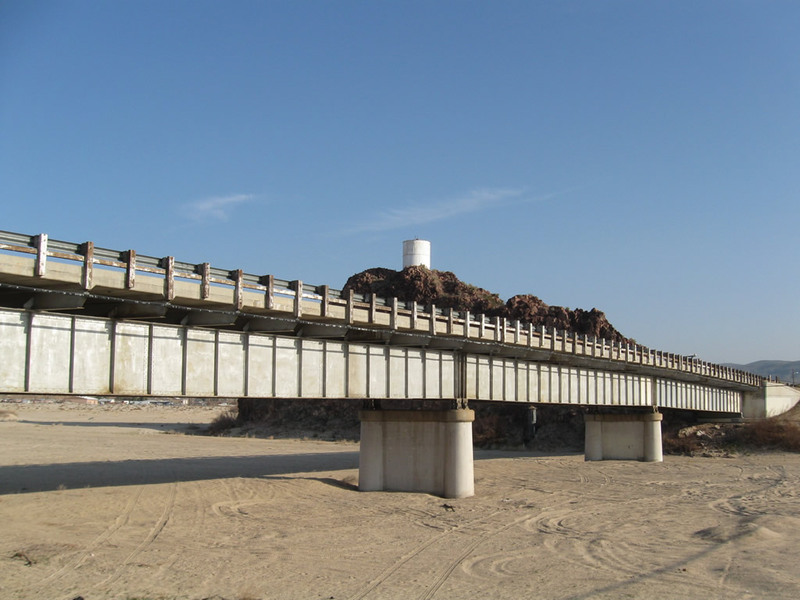 An old bridge carries Historic U.S. 91-466 (Baker Boulevard) northeast over the Mojave River, a seemingly dry river that links to Soda Dry Lake to the south. Photo taken 11/11/08. 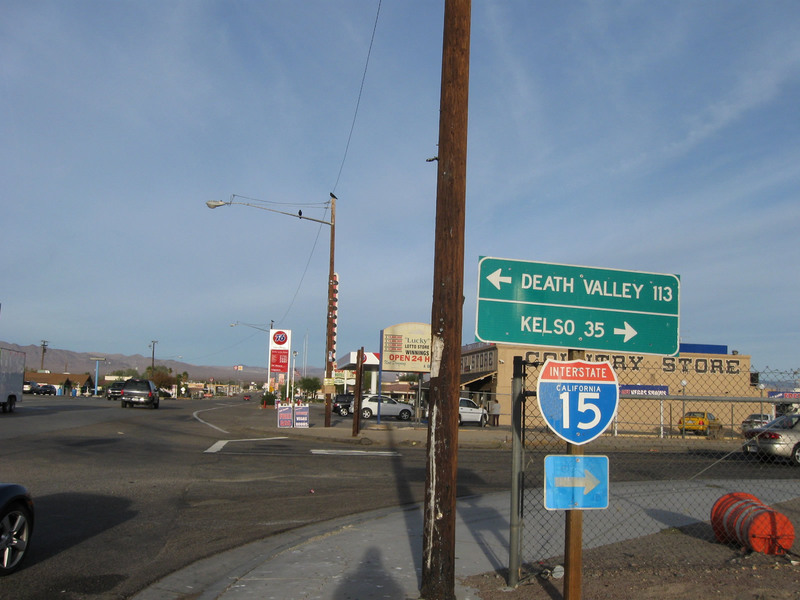 The next major intersection along U.S. 91-466 north is with California 127 (Death Valley Road) north to Shoshone and Death Valley and California 127 (Kelbaker Road) south to Interstate 15 and Kelso (the state route designation ends at I-15). 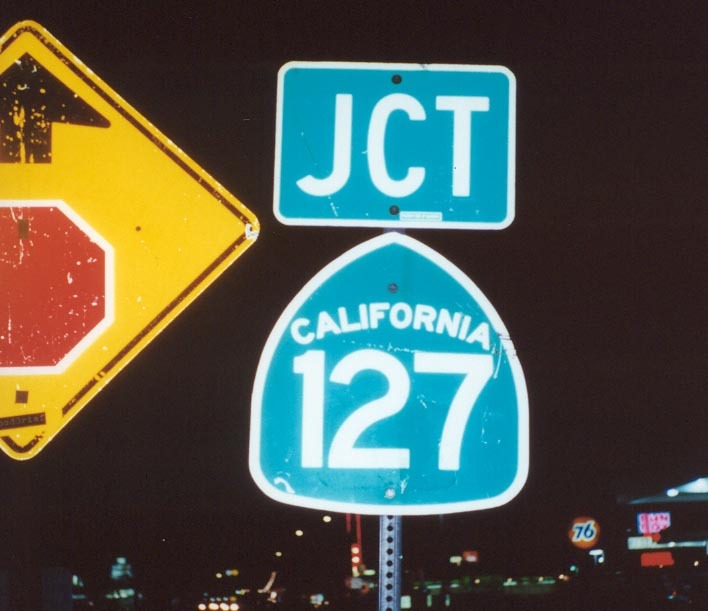 The California 127 shield has taken quite a beating in eight years; as of 2008, it was covered in stickers and graffiti. Photos taken 11/11/08 and 11/11/00. 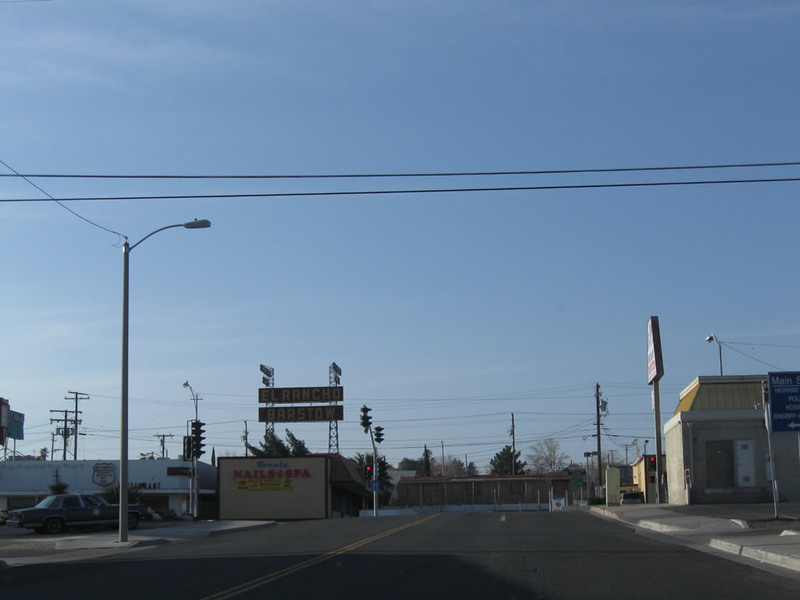 Northbound Historic U.S. 91-466 (Baker Boulevard) approaches California 127 in downtown Baker. 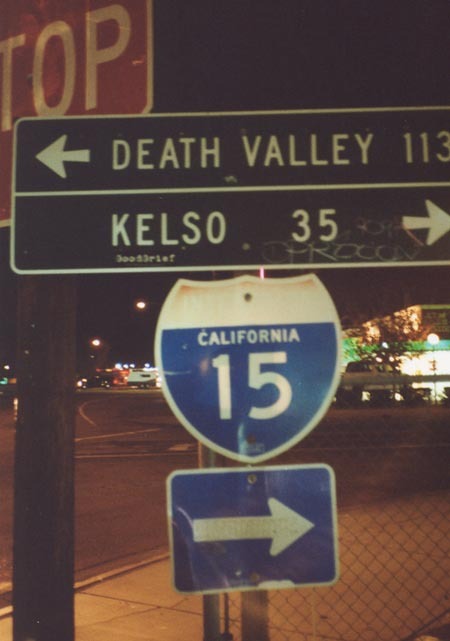 Turn right to Interstate 15 and Kelbaker Road southeast to Kelso. 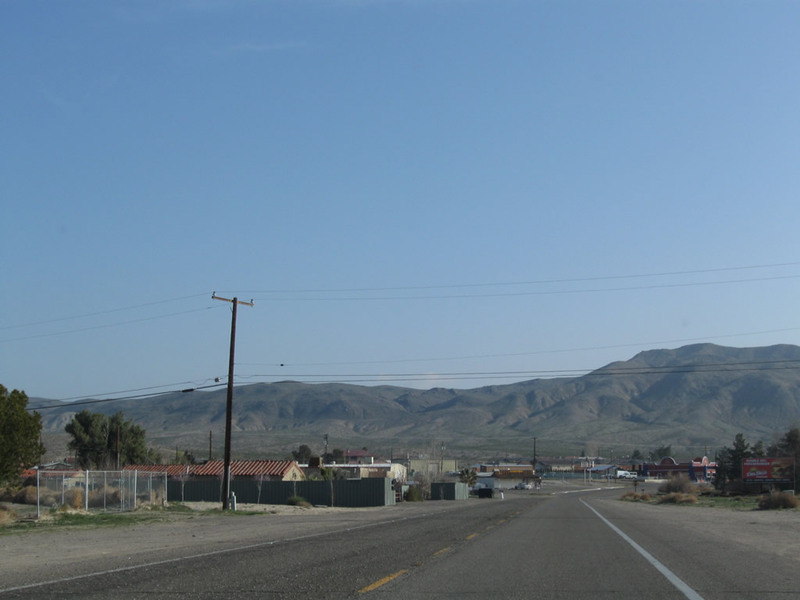 Turn left for California 127 north to Death Valley National Park and Shoshone. Photos taken 11/11/08 and 11/11/00. 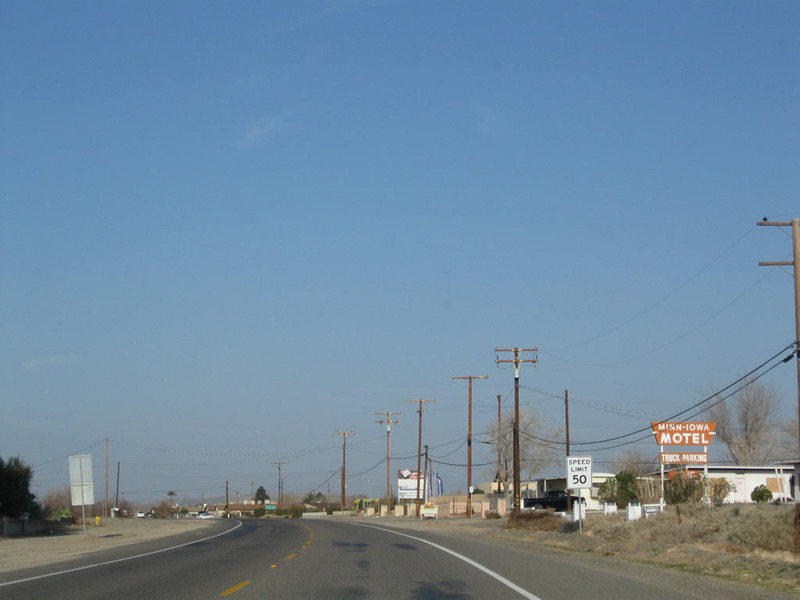 After the California 127 four-way intersection in downtown Baker, northbound Historic U.S. 91-466 proceeds past several restaurants, gas stations, and motels. Photo taken 11/11/08. 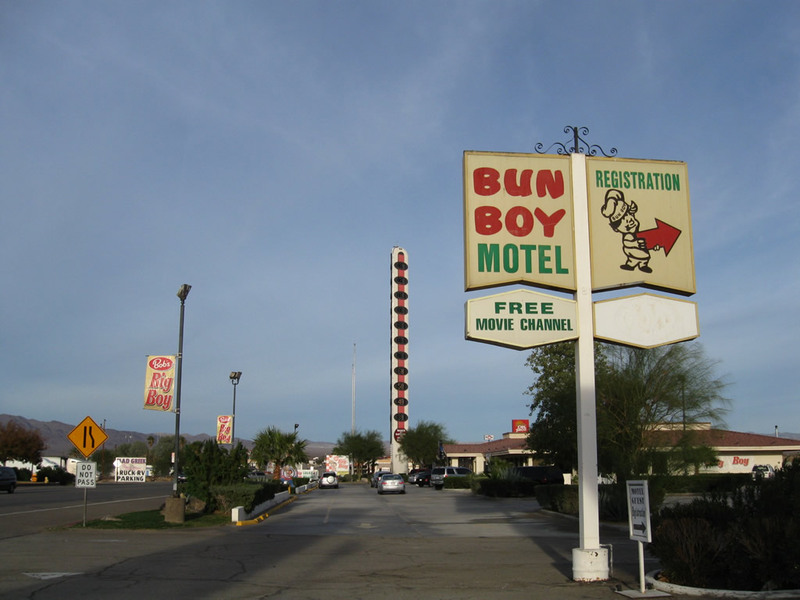 The Bun Boy Motel is all that remains of the Baker Bun Boy, which used to feature a well-advertised restaurant that today is Bob&apos; Big Boy. Photo taken 11/11/08. 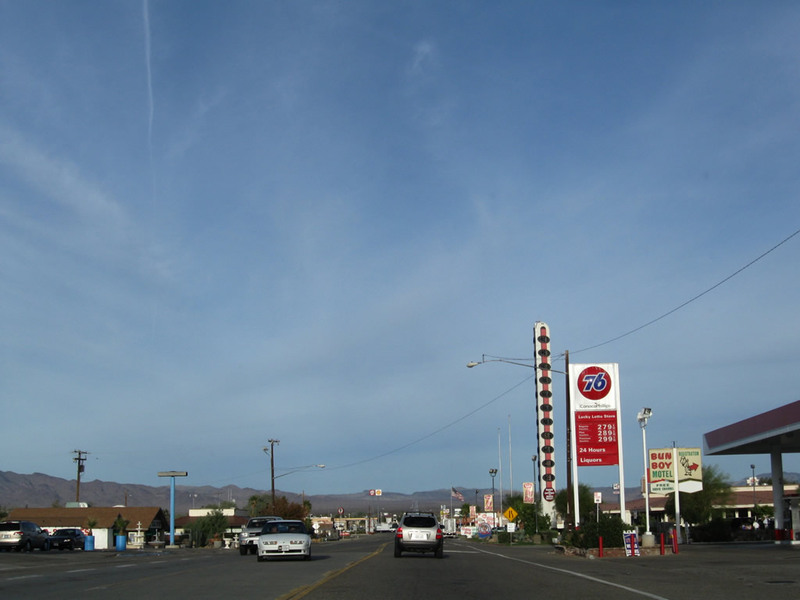 Standing at 134 feet, the Baker Thermometer towers above the nearby gas stations and restaurants near the site of Bun Boy (now Bob&apos; Big Boy). 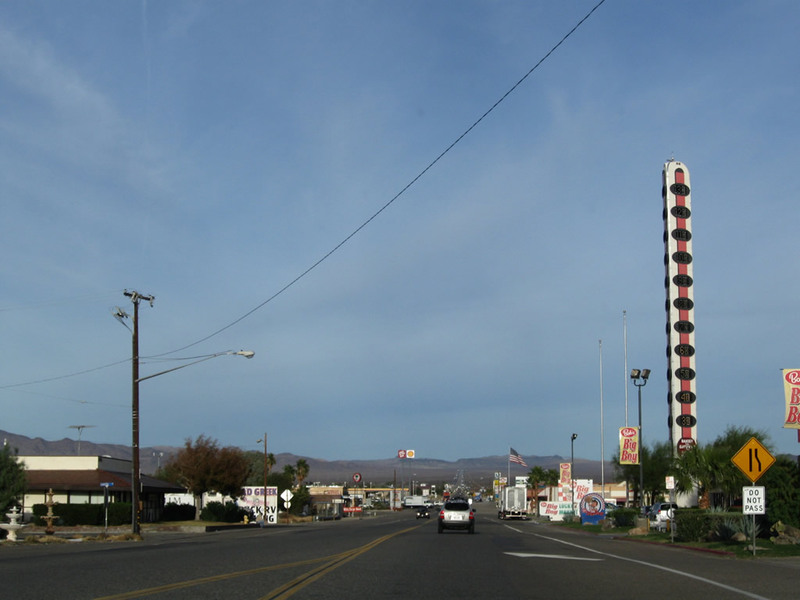 The thermometer was erected in 1991 and is visible from nearby Interstate 15 and often shows temperatures in excess of 100 degree Fahrenheit each summer. 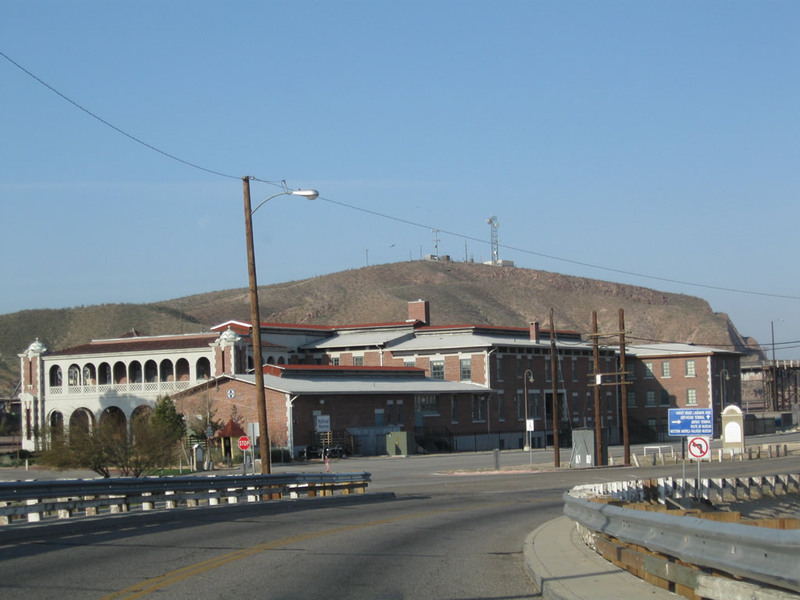 The 134-foot height of the World&apos; Largest Thermometer is based on the highest recorded temperature in Death Valley (134 degrees Fahrenheit in 1913). 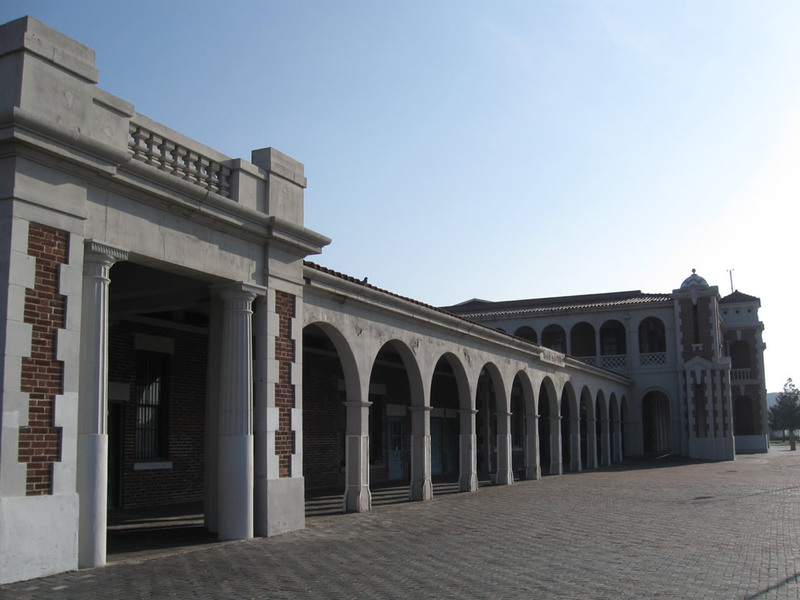 Photo taken 11/11/08. 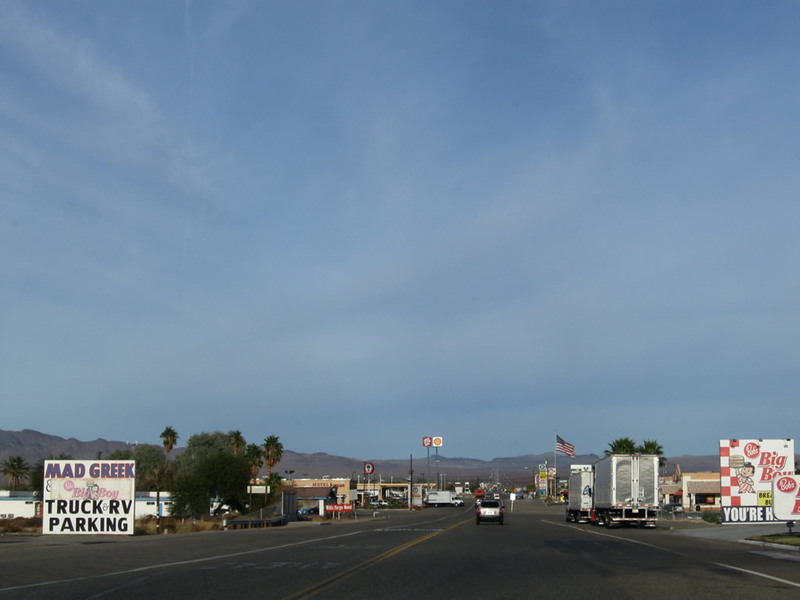 Services line both sides of Historic U.S. 91-466 (Baker Boulevard), including food, gas, and lodging. 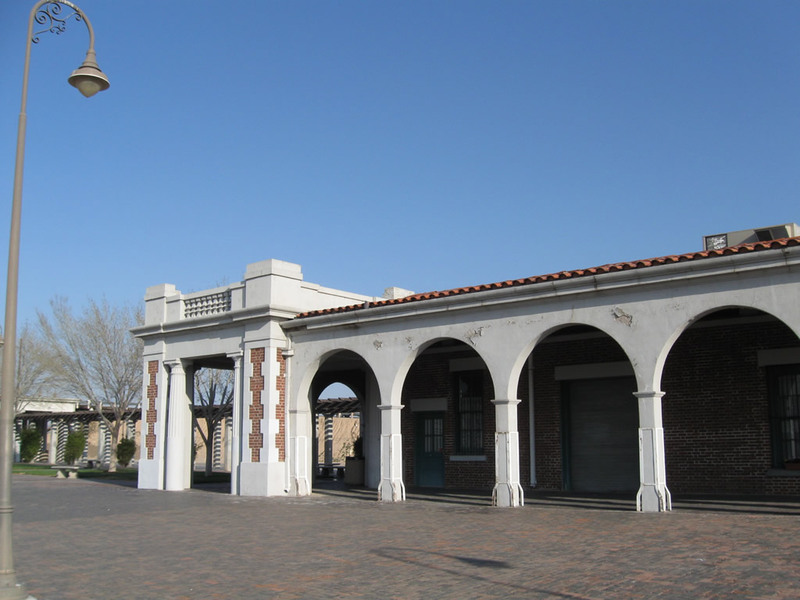 A garage is available to assist motorists with disabled vehicles in the vast desert. Photos taken 11/11/08. 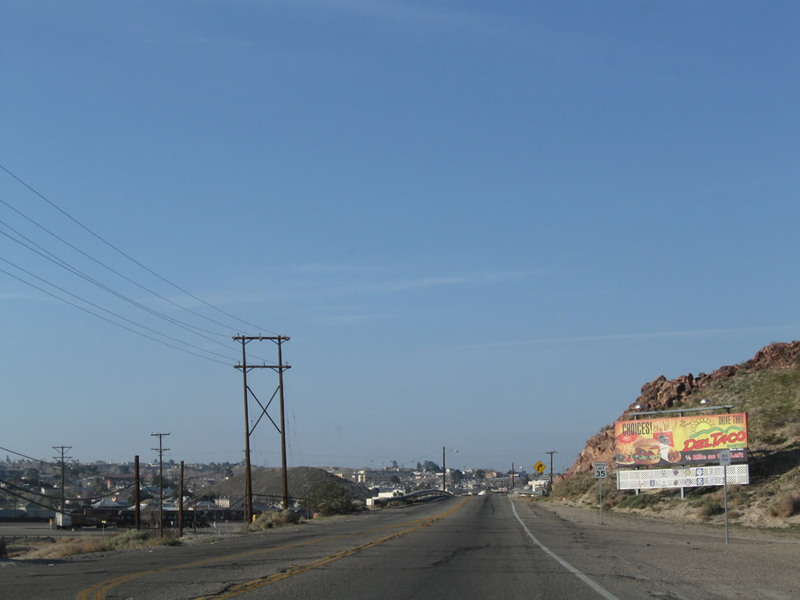 Historic U.S. 466 leaves Interstate 15 at the Old Highway 58 interchange northeast of Barstow. 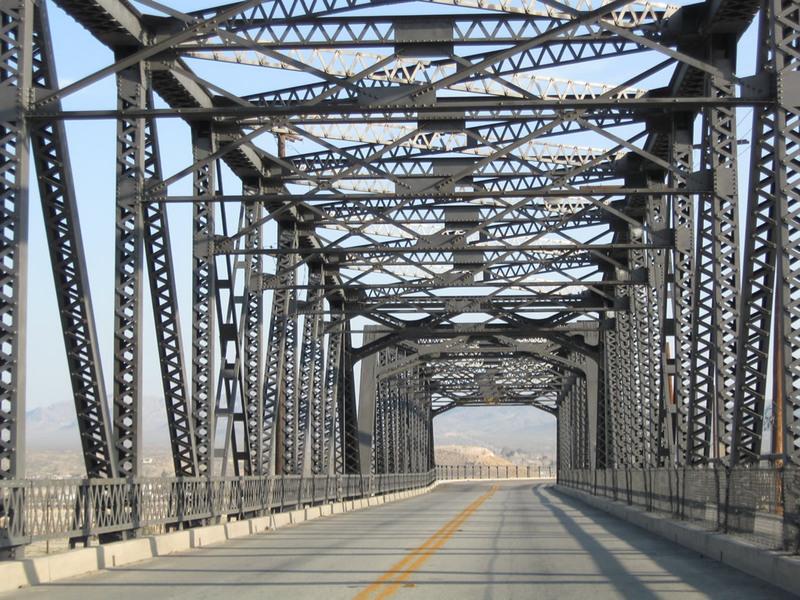 The Interstate 15 bridge over the Mojave River was not preceded by any U.S. highway. 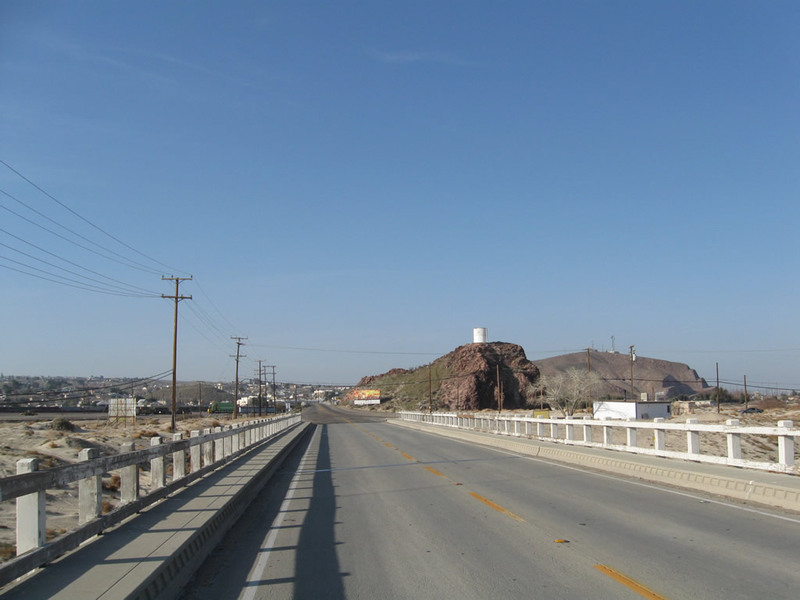 U.S. 91 used to follow U.S. 466 west for the first several miles, and the routes used to divided north of downtown Barstow. 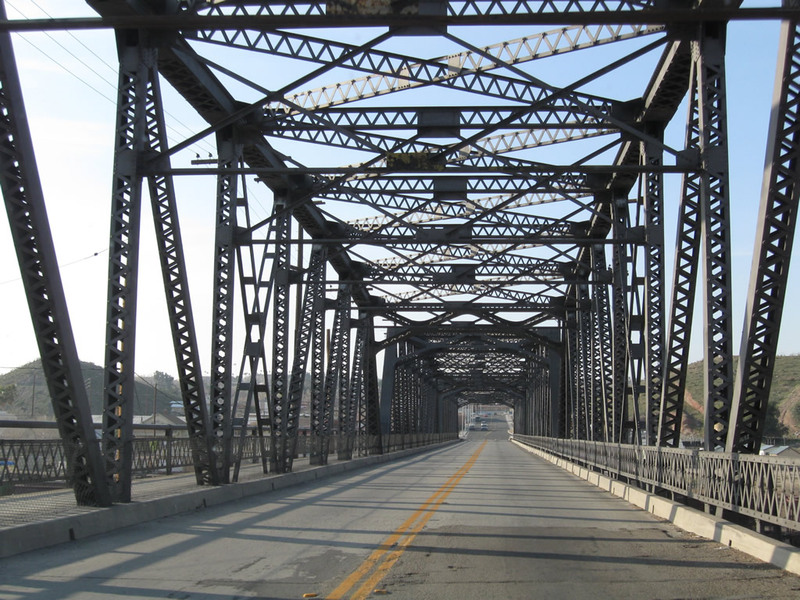 While U.S. 466 was decommissioned in 1964, another 35 years before the route was bypassed by the current California 58 freeway. 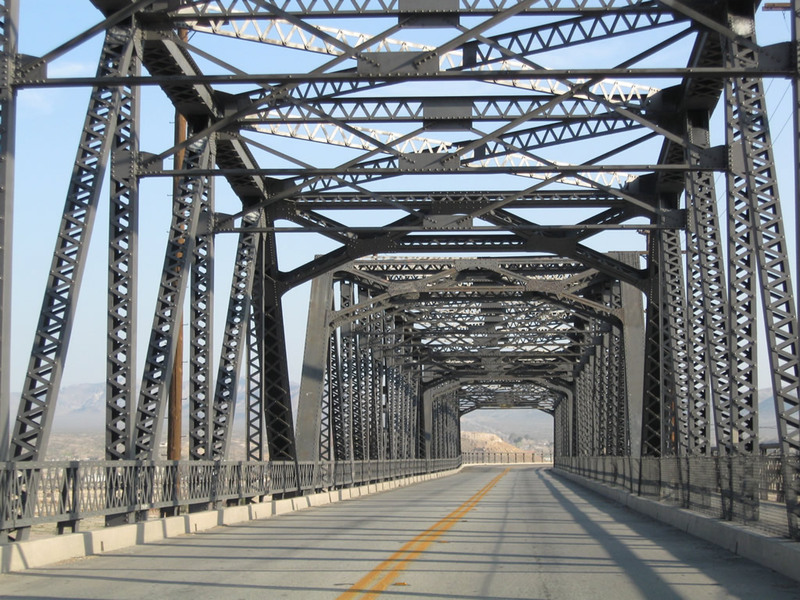 During those 35 years, this old alignment was signed and designated as California 58. Photo taken 03/15/09. 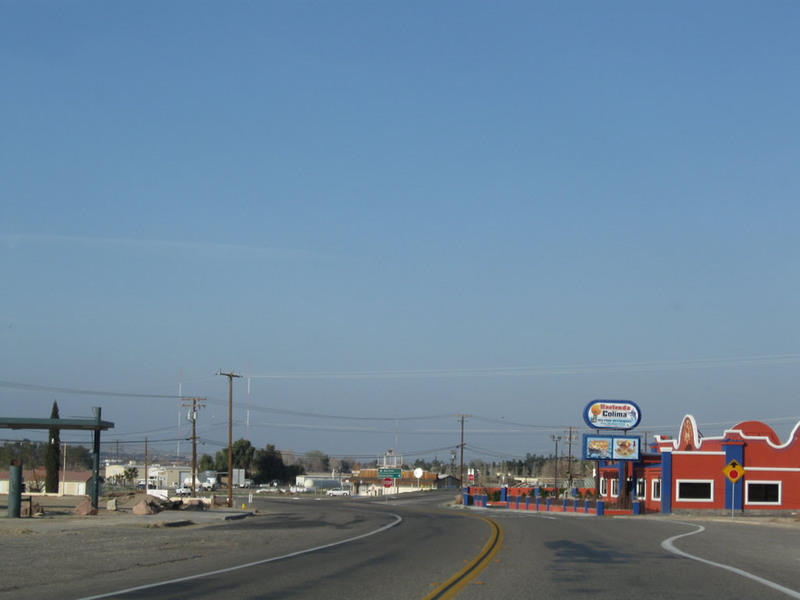 A former drive-in movie theater is located on the north side of Old Highway 58. The screen is still in place. Photo taken 03/15/09. 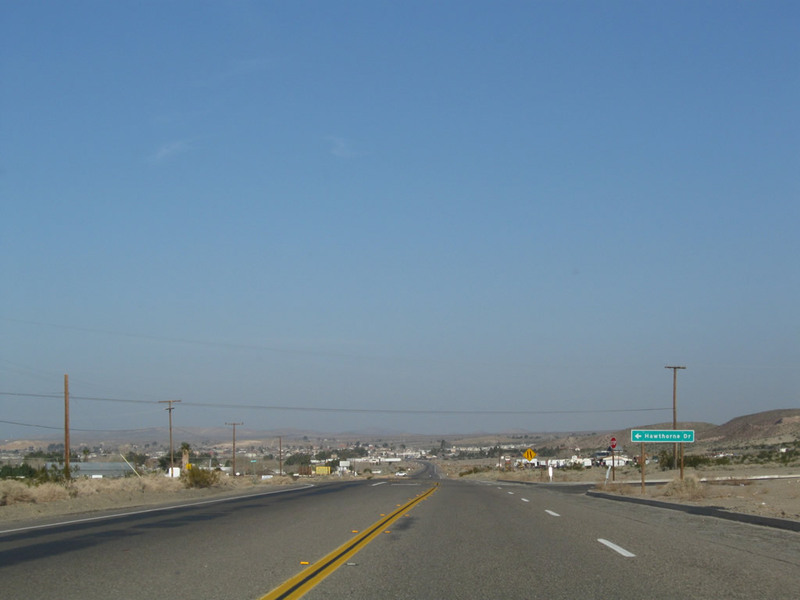 Westbound Old Highway 58 approaches Hawthorne Drive. Photo taken 03/15/09. 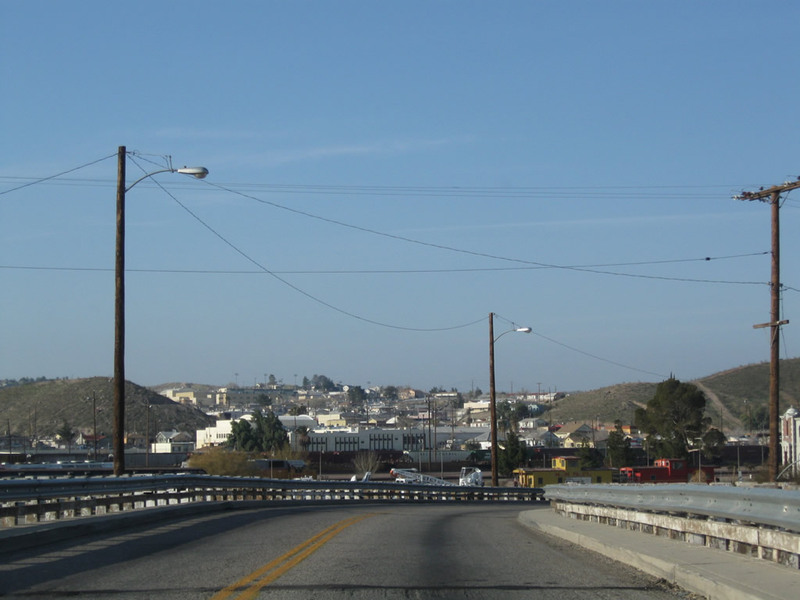 The two-lane highway continues west toward Barstow on a route that roughly parallels the Mojave River while staying on the north side of the river. Photo taken 03/15/09. 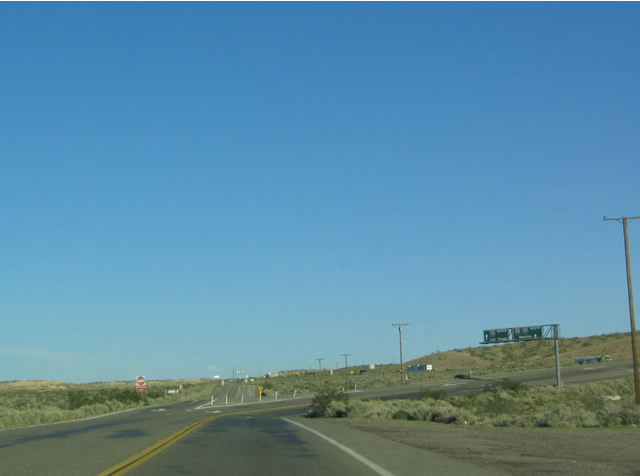 The U.S. highways used to divide at the intersection with First Avenue, which is the next stop sign. 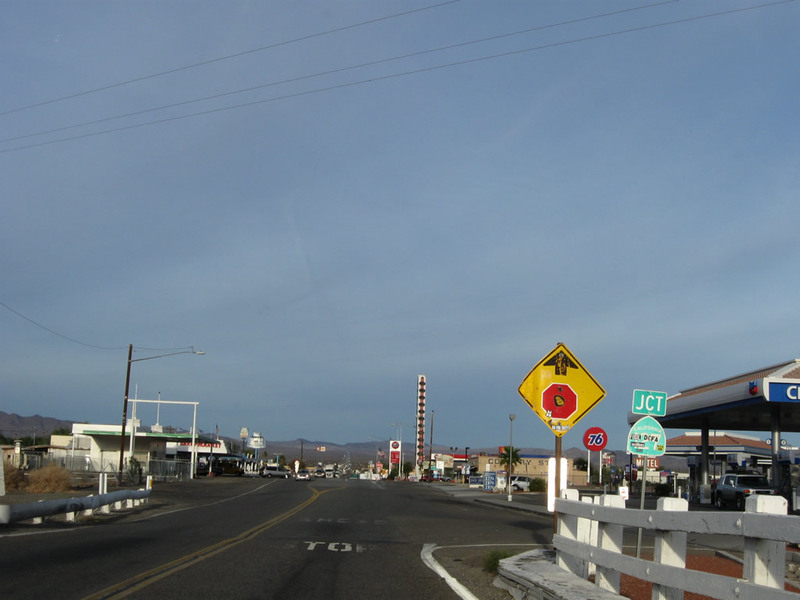 Traffic following old U.S. 91 south into Barstow should continue straight along First Avenue, while former U.S. 466 and Old Highway 58 turn right to avoid the city and proceed west toward Mojave and Bakersfield. Photo taken 03/15/09. 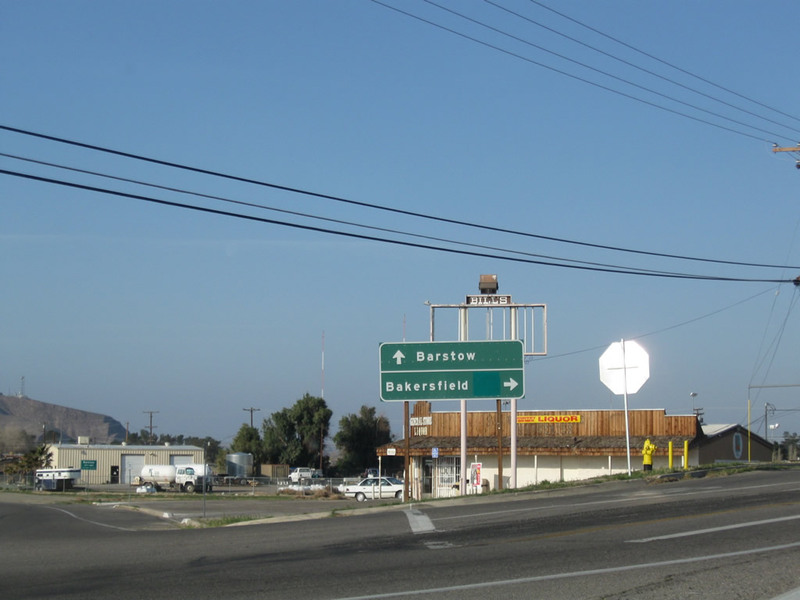 At the intersection of First Avenue and Old Highway 58 is this sign pointing the way to Barstow (via Historic U.S. 91 south) and Bakersfield (via Old Highway 58 west). 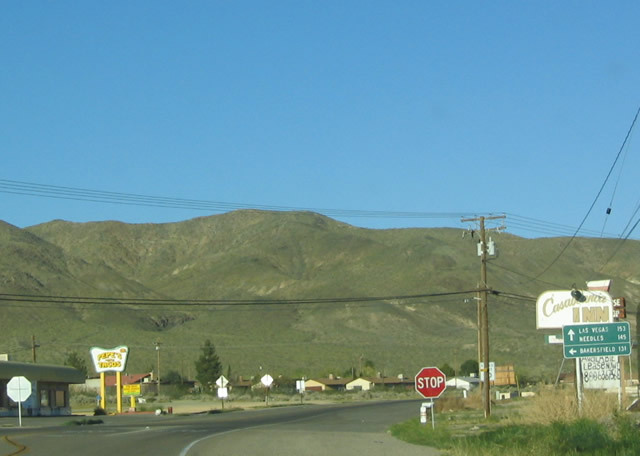 The green overlay on the sign covers a California 58 shield. Photo taken 03/15/09. 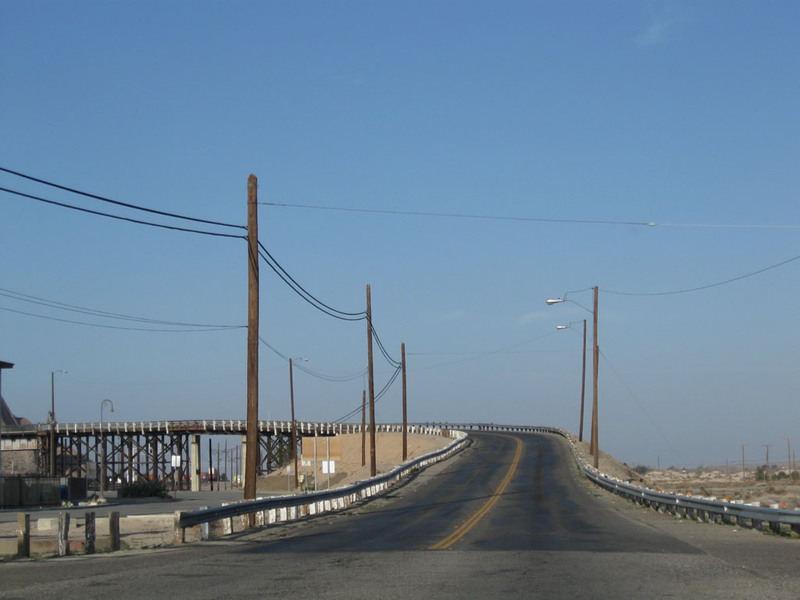 Between Old Highway 58 and Irwin Road, Historic U.S. 91 crosses a mostly dry wash that leads into the Mojave River. 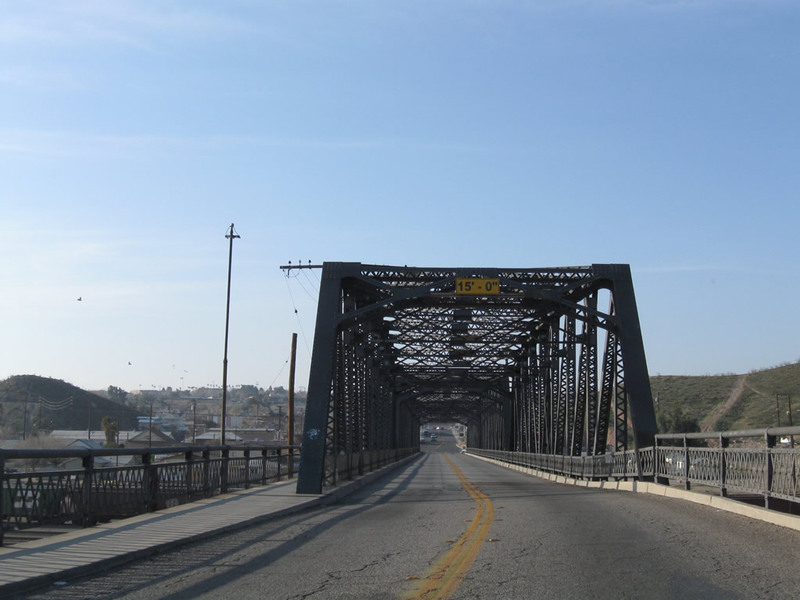 This bridge was constructed in 1939 according to the date stamp. Photos taken 03/15/09. 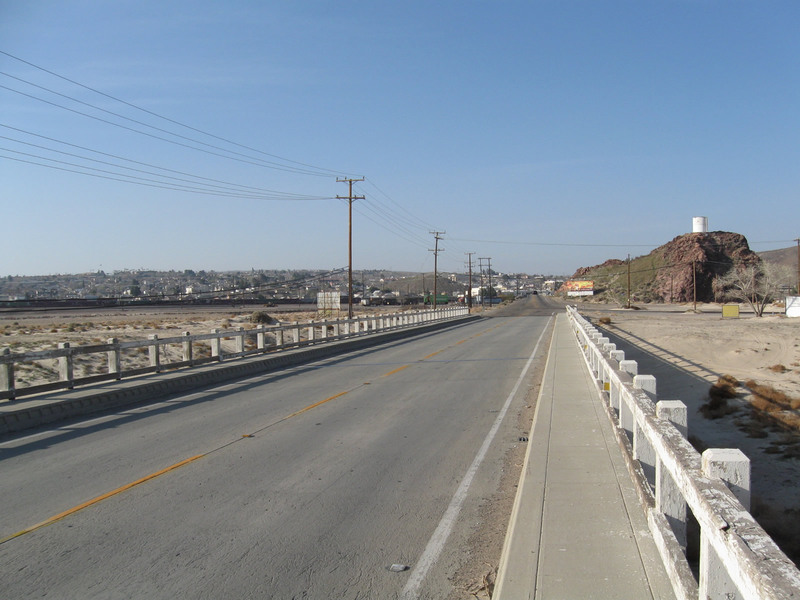 After the Irwin Road intersection, southbound Historic U.S. 91 (First Avenue) approaches the main Mojave River crossing that carries the former U.S. highway into downtown Barstow. Photo taken 03/15/09. 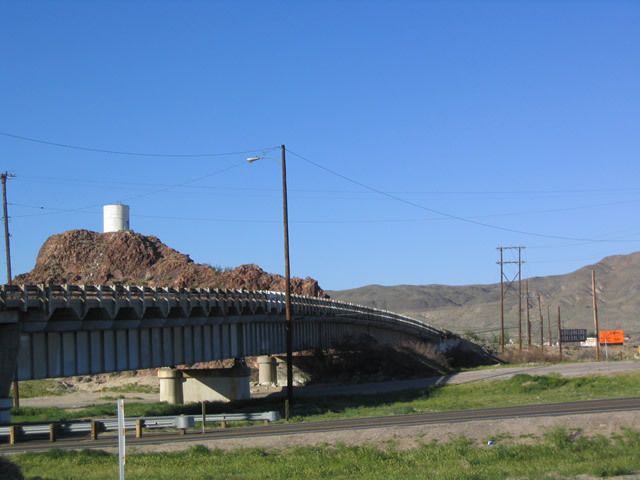 A curving bridge carries First Avenue over the Mojave River, which remains apparently dry most of the time. 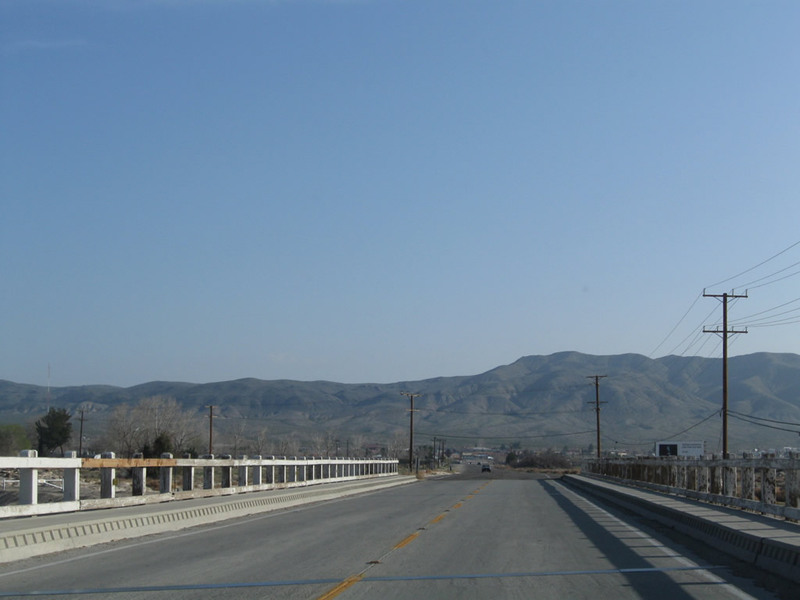 Old bridge railing is obscured by newer standard guardrail. 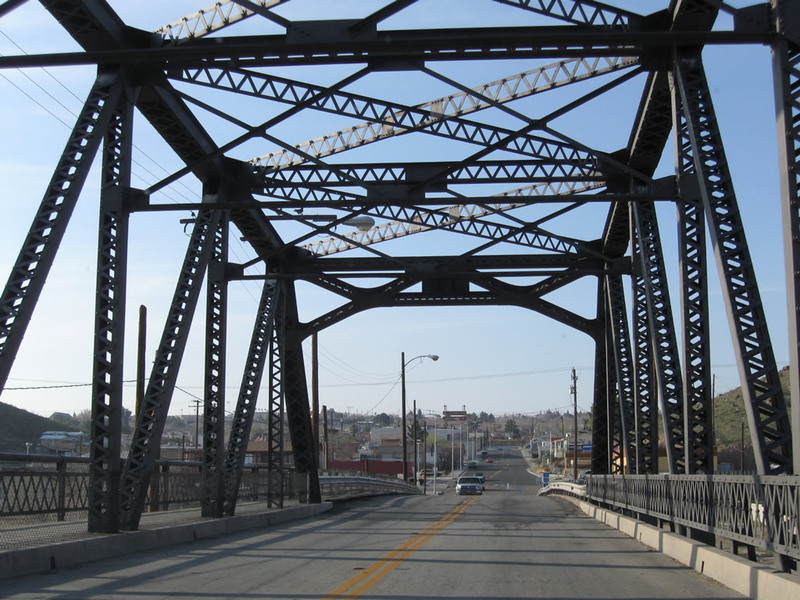 At the end of the bridge is the railroad depot, which includes a Route 66 Museum. Photos taken 03/15/09. 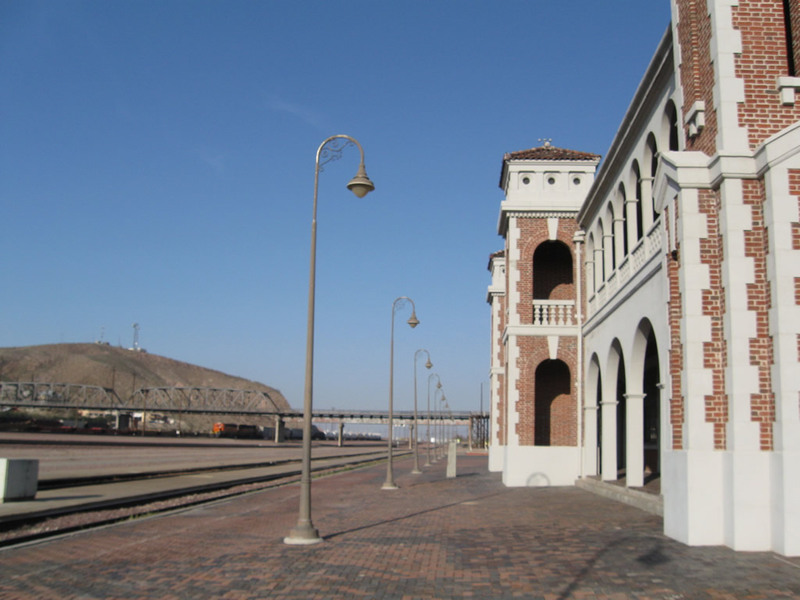 A right turn to Crooks Avenue is required to make the link to the Railroad Depot, which includes the Harvey House (Casa del Desierto), Route 66 Museum (open since July 4, 2000), Western America Railroad Museum, and Amtrak / Greyhound Terminal. 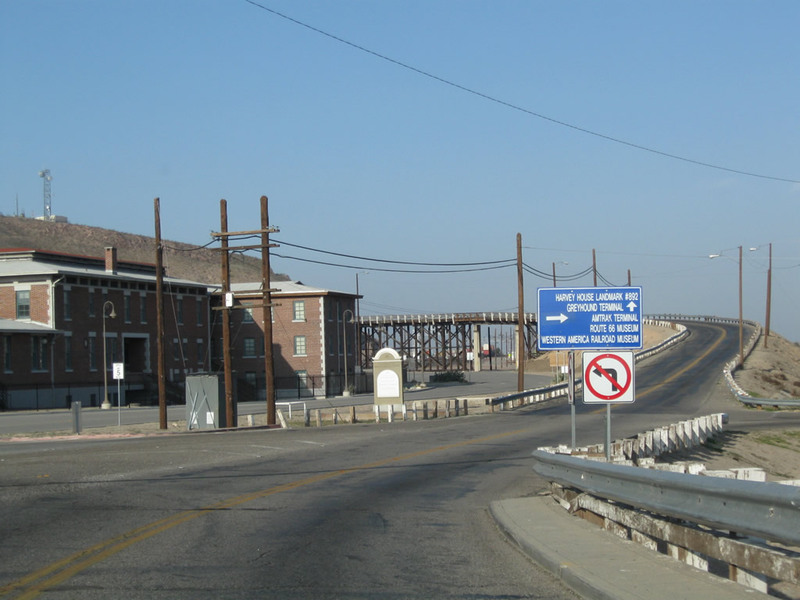 Continue straight ahead to follow First Avenue across the railroad yard to downtown Barstow and U.S. 66 (the Main Street of America). Photo taken 03/15/09. 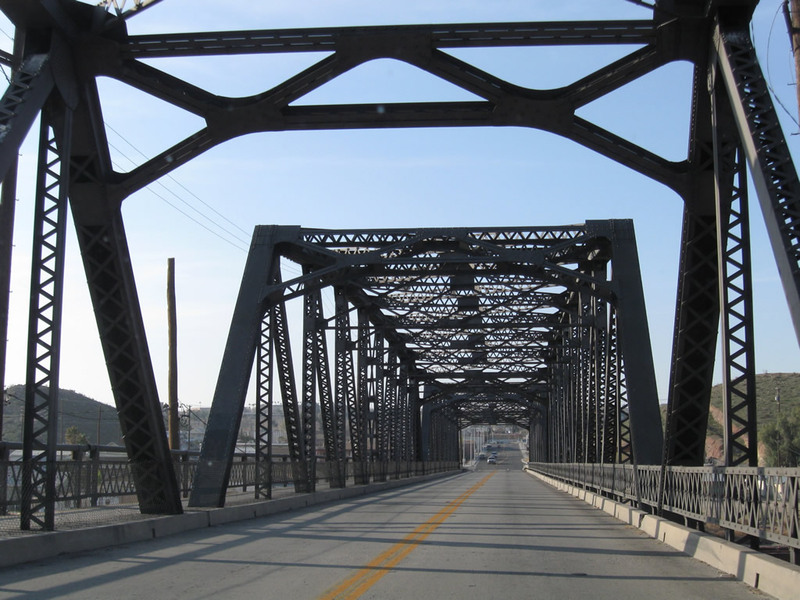 Southbound Historic U.S. 91 (First Avenue) gains elevation for its journey across the Old Iron Bridge, which opened on April 26, 1930. 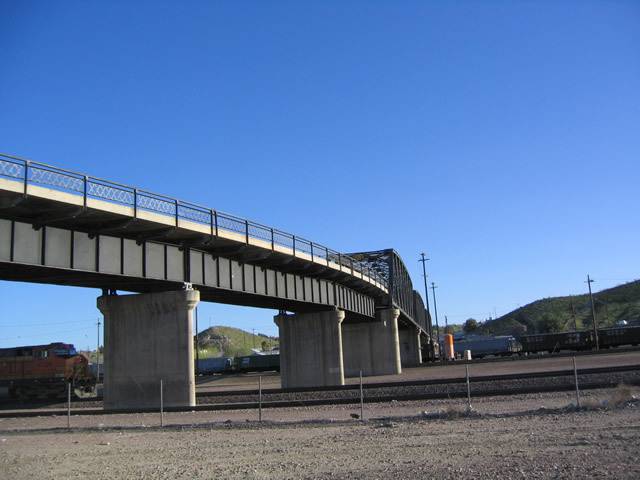 This old bridge is still in use today, and was in use back when it carried U.S. 91 across the Burlington Northern Santa Fe (BNSF) Railroad yard. 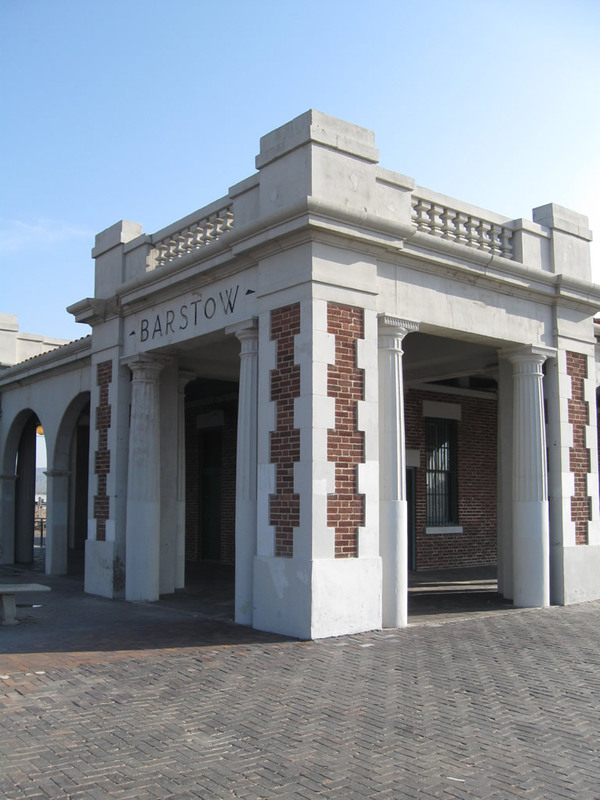 It links downtown Barstow with the historic Harvey House, which was built in 1911. Photos taken 03/15/09. 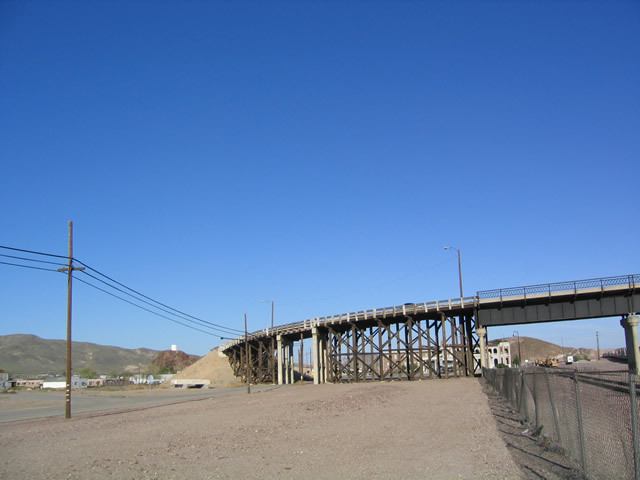 This view shows the Old Iron Bridge, which carries Historic U.S. 91 (First Avenue) over the Santa Fe rail yards, looking southeast toward downtown Barstow. Photo taken 03/20/04. 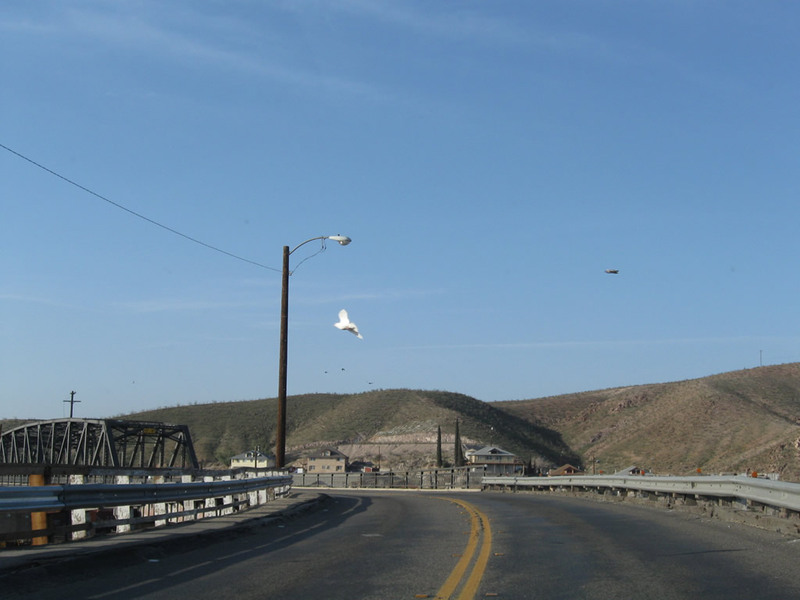 Now on the northeast side of the bridge, looking south, a train begins to pass under the historic U.S. 91 bridge over the rail yards in Barstow. Photo taken 03/20/04. 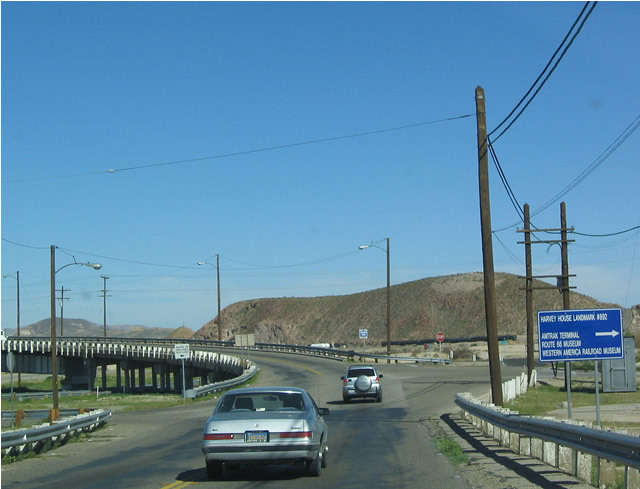 An Interstate 15 trailblazer is posted on southbound Historic U.S. 91 (First Avenue) after crossing the Old Iron Bridge. Photo taken 03/15/09. 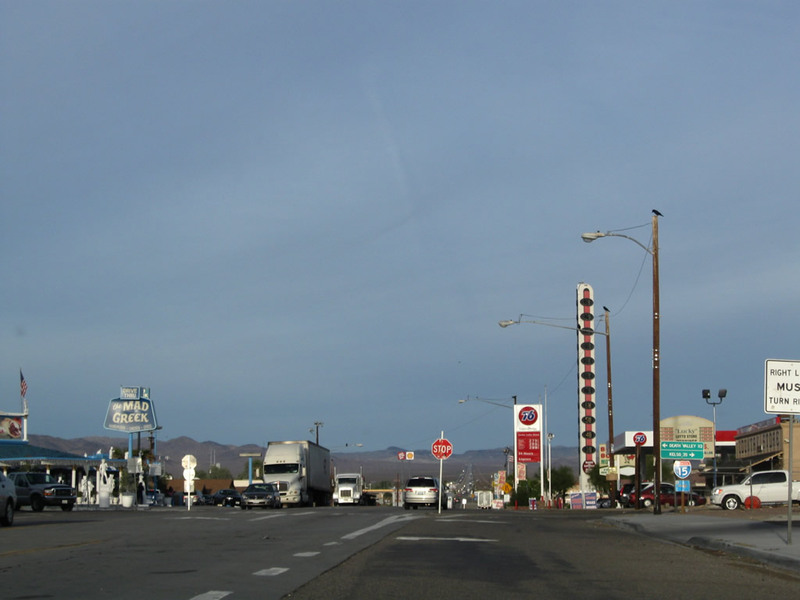 Southbound Historic U.S. 91 (First Avenue) approaches Business Loop I-15 and Historic U.S. 66 (Main Street) in downtown Barstow. 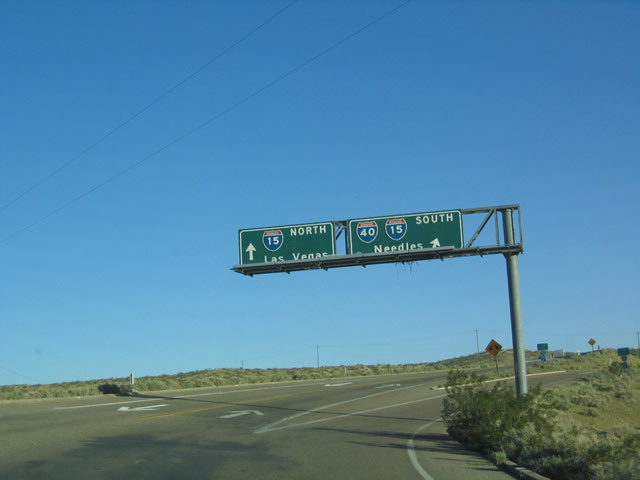 Turn left to follow U.S. 66 east to Interstate 15 north or Interstate 40 east, or turn right to follow U.S. 66-91 southwest to Victorville and San Bernardino. Photo taken 03/15/09. 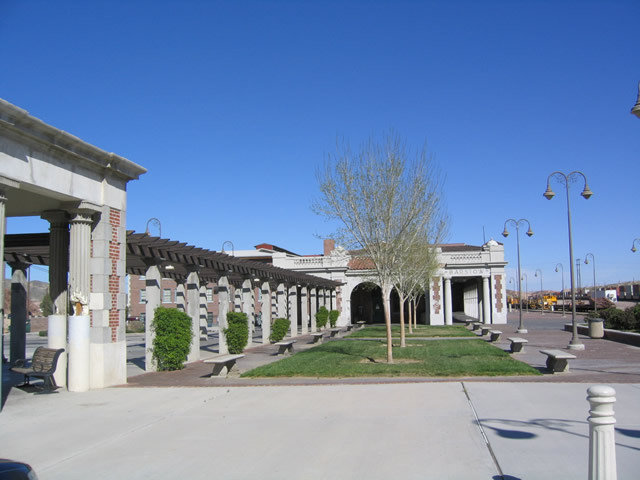 The Harvey House, also known as the "Casa del Desierto," faces the large rail yard in Barstow. 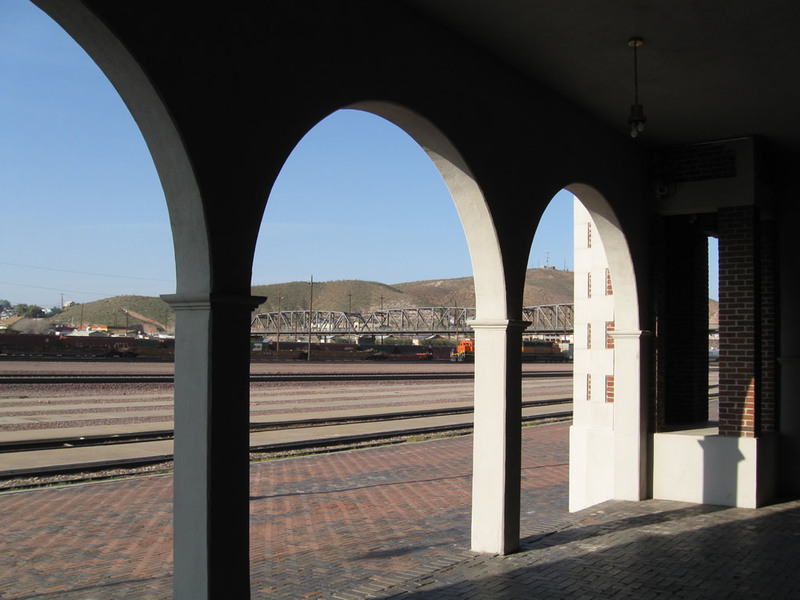 Most recently used as part of a Greyhound and Amtrak depot, the Harvey House still contains two museums - one dedicated to U.S. 66 and the other to railroads and trains. Photo taken 03/20/04. 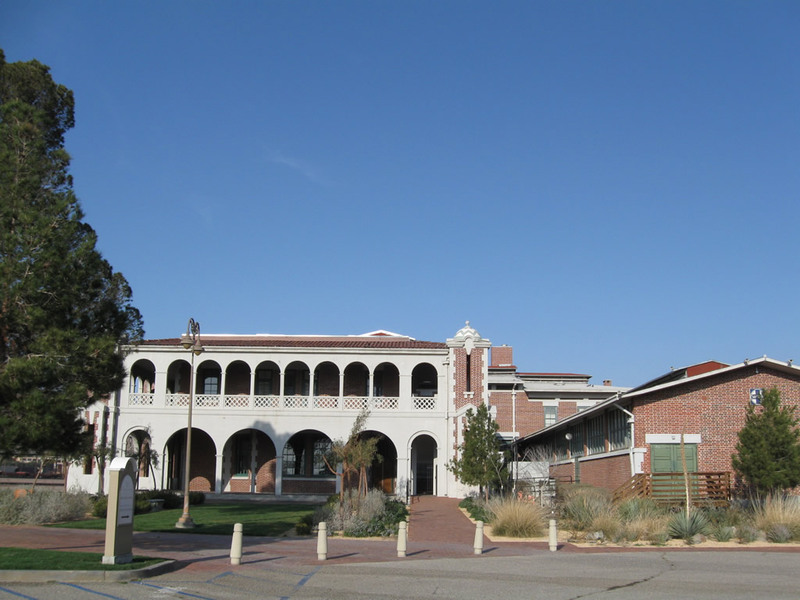 Built in 1911, the Harvey House was at one time operated by Fred Harvey. The house was used by travelers and employees visiting the area and in need of a place to stay. Photo taken 03/20/04. 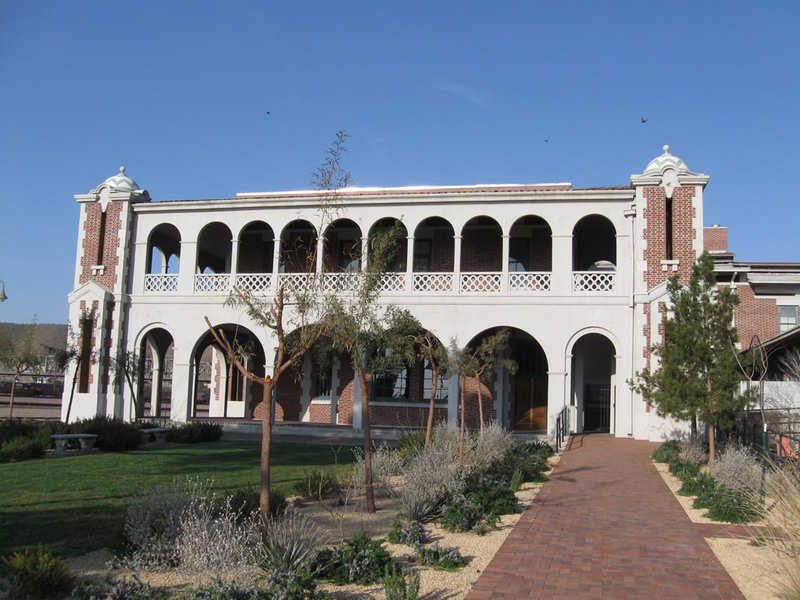 View of the promenade on the south end of the Harvey House, looking north. 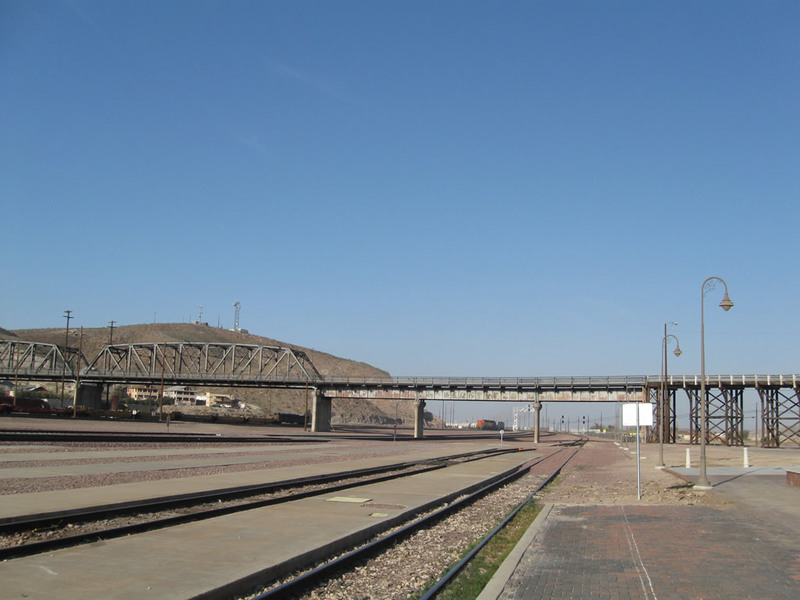 The rail yard is to the right, while U.S. 91 is located to the left. 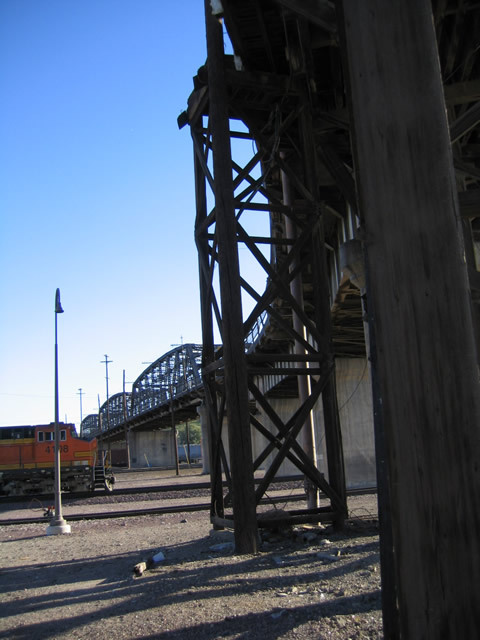 Photo taken 03/20/04. 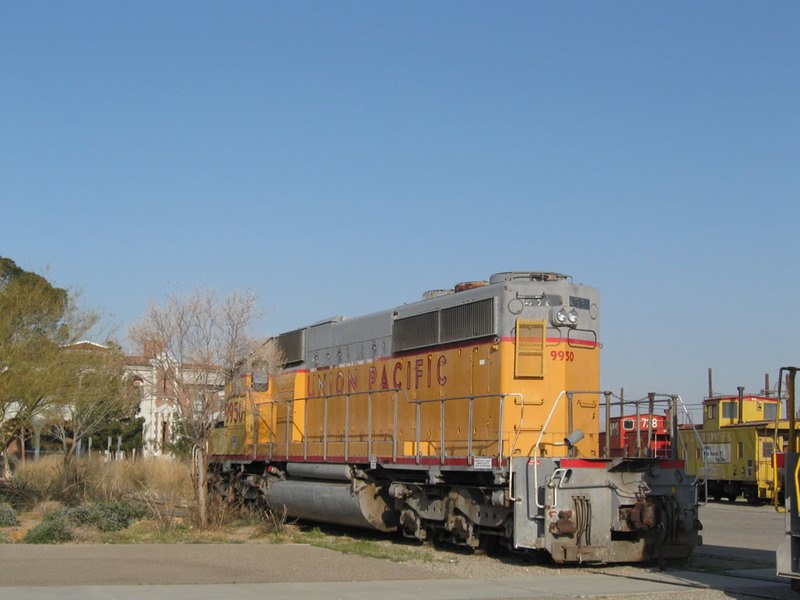 On the grounds of the Harvey House are several old locomotives and cabooses that are no longer in use; they positioned around the Harvey House adjacent to the Burlington Northern Santa Fe (BNSF) Railyard in Barstow. Photos taken 03/15/09. 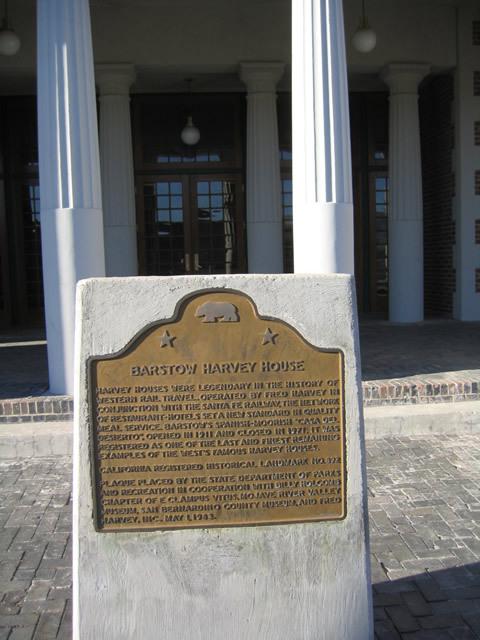 This suite of photos shows the Harvey House and its ground five years after the photos above. 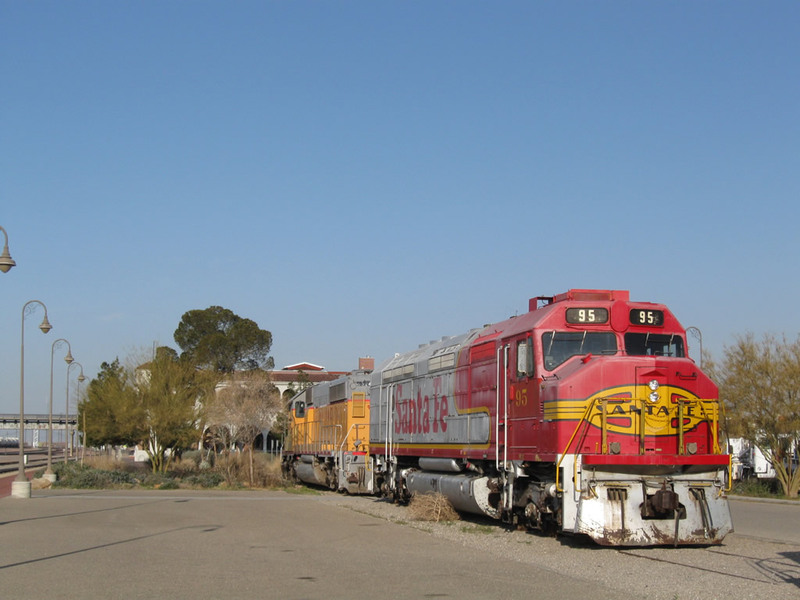 The grounds include the Western American Railroad Museum, Historic Route 66 Museum, and a great view of the Burlington Northern Santa Fe (BNSF) Railyard in Barstow. Photos taken 03/15/09. 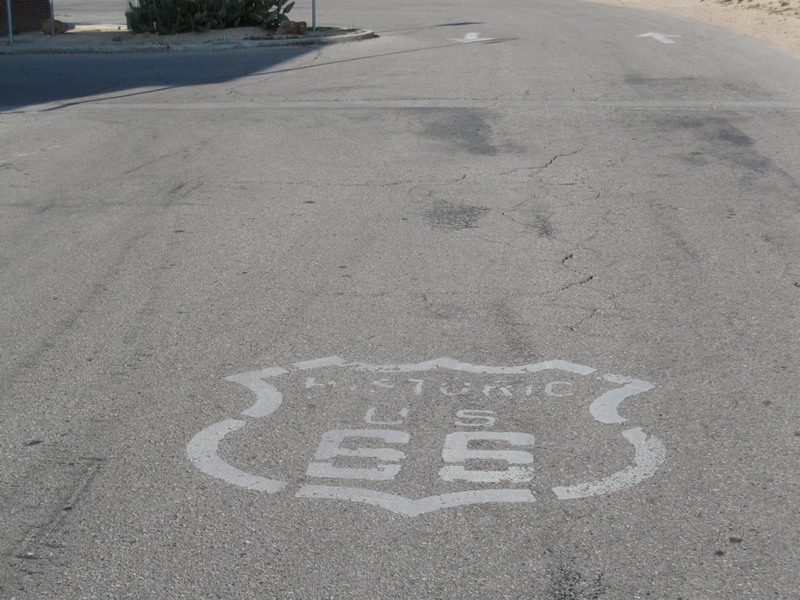 On the pavement in the parking lot for the historic Barstow railroad depot and Harvey House is a Historic U.S. 66 marker, which is located in front of the Historic U.S. 66 Museum. 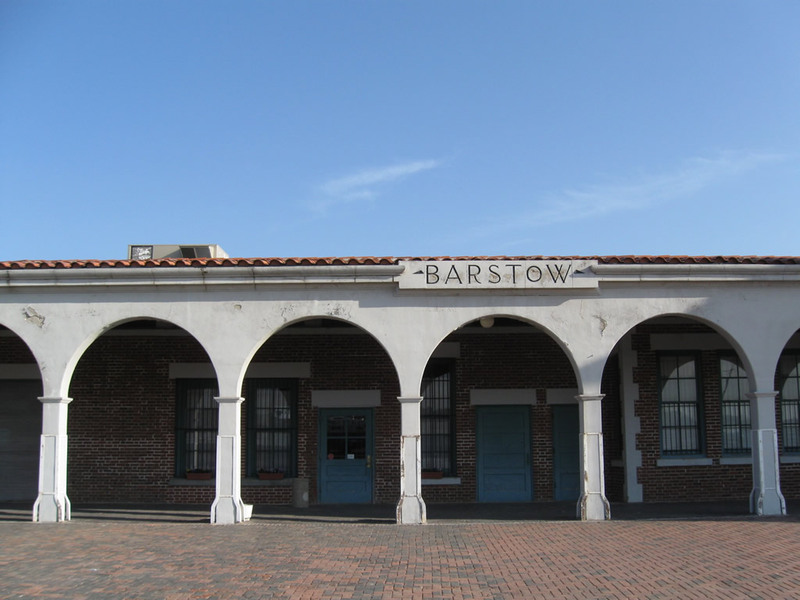 The museum sits immediately off of Old U.S. 91 and about a quarter mile away from Historic U.S. 66 (Main Street) in downtown Barstow. Photo taken 03/15/09. 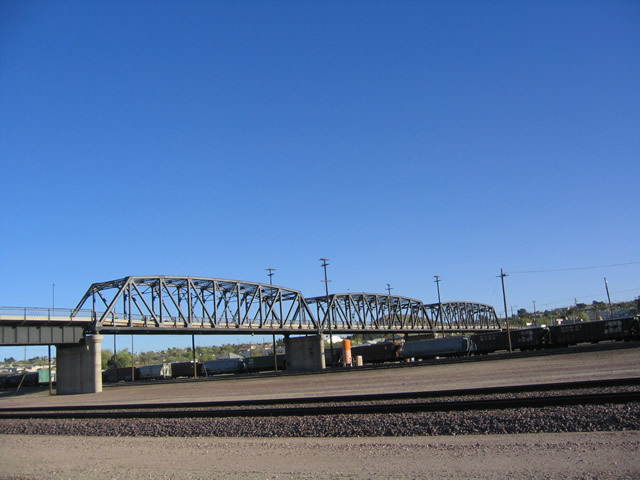 These views of the U.S. 91 Old Iron Bridge over the rail yard are taken from the grounds of the Harvey House. Photos taken 03/20/04 and 03/15/09. Page Updated August 25, 2009.